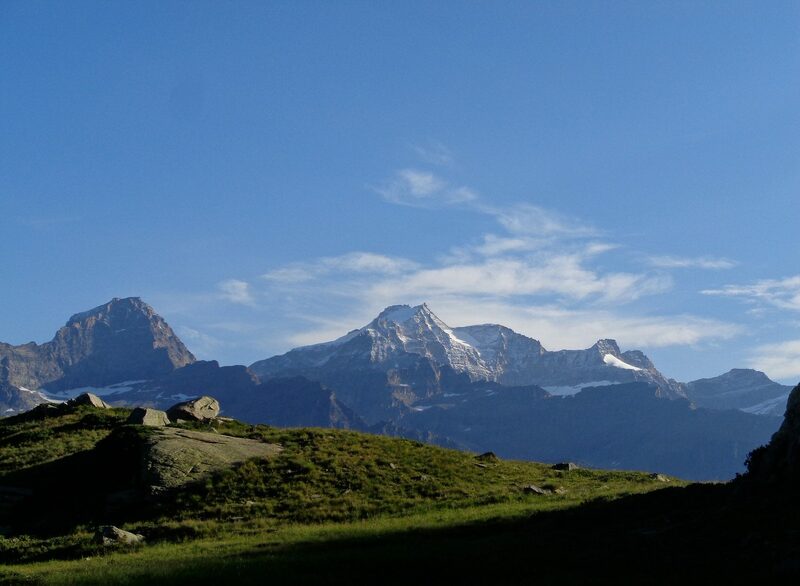 GTA: Grande Traversata delle Alpi, Iris Kürschner and Dieter Hass; Rother 2012. Originally published in German, this guide book has been translated to English. There is also a Cicerone Press guide to the route; we bought both books and only carried the Rother version because it was clearly superior. GTA Wikipedia entry. This entry primarily discusses the original routing of the GTA. There is also a four volume comprehensive guide, available only in German, which we did not acquire. 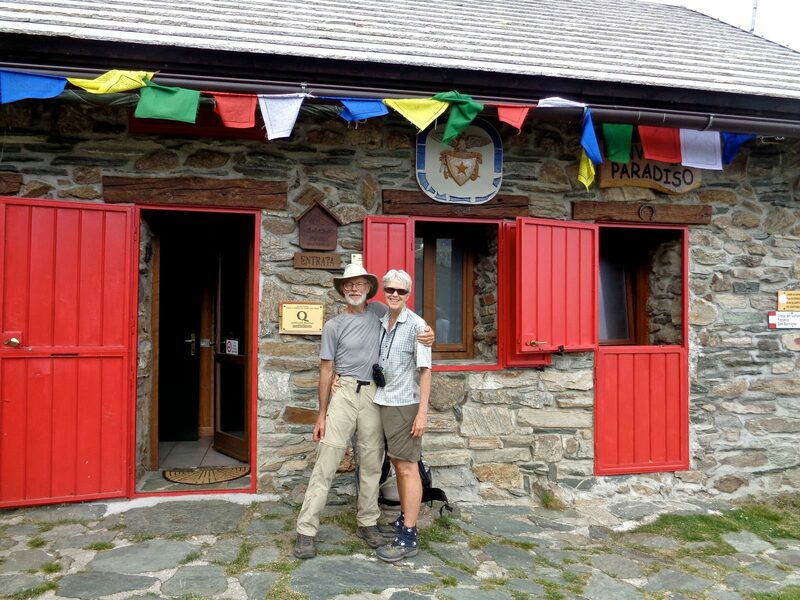 In 2014 we took our first trip to the European Alps and hiked the Alpe-Adria Trail in Italy, Slovenia, and Austria. 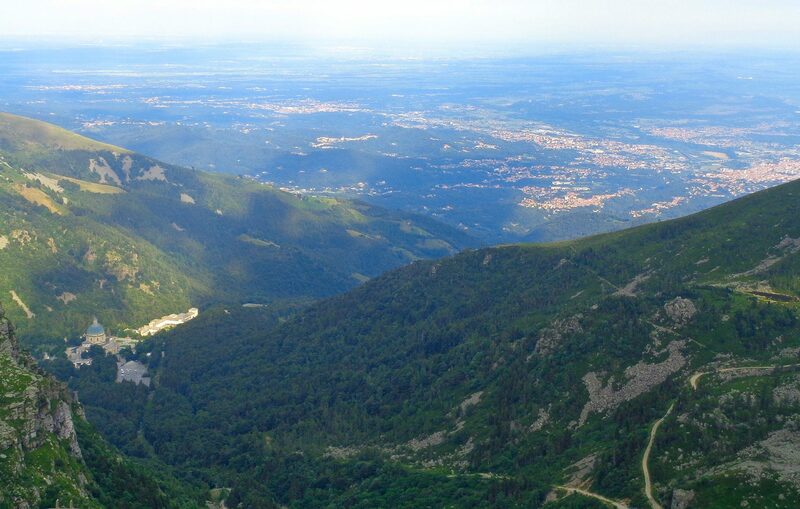 The trip was reasonably satisfying, but did not get us into the higher mountains. 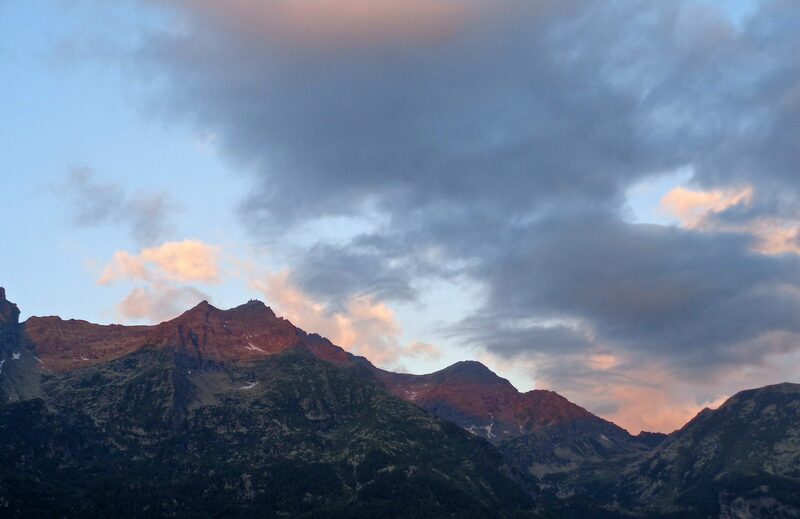 We have been reticent about traveling in the French/Swiss “core” of the Alps centered on the Mt. 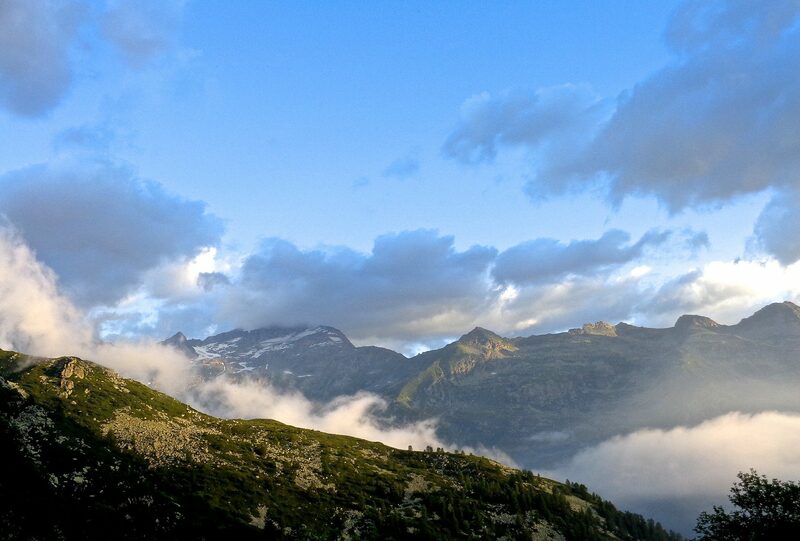 Blanc/Matterhorn region. 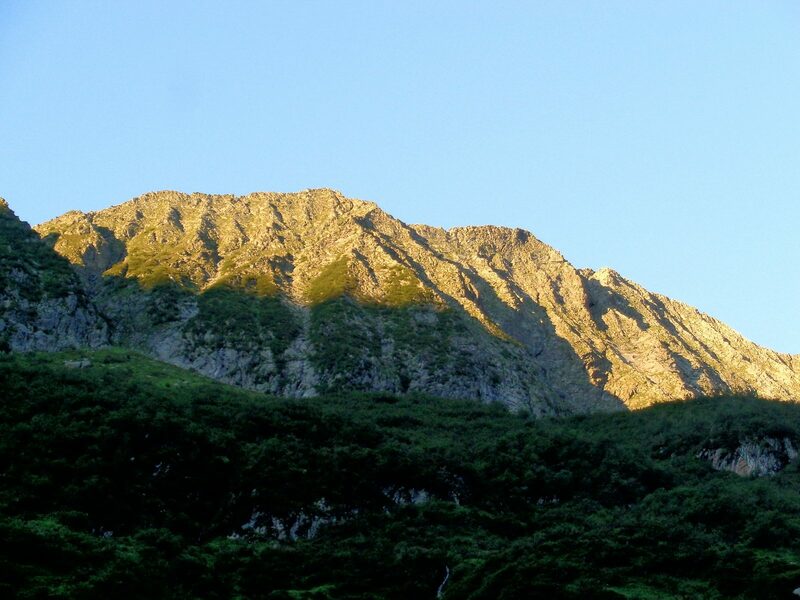 We have read that the region is very popular and is extremely crowded during the relatively short hiking season. Also, we like to camp on backpacking trips but using a tent is highly restricted in those areas. While exploring options for another long distance European thru-hike we discovered references to the GTA. The available information was spotty and the GPS tracks we could find were very inconsistent. We bought the Cicerone guide to the route but found it functionally useless. Then we discovered the Rother Guide was published in an English version and bought that. 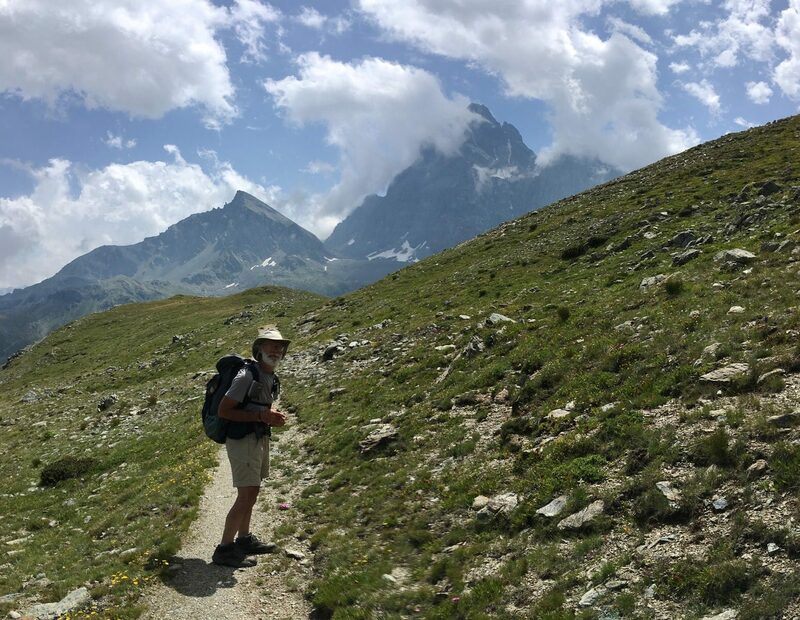 Reading that guidebook convinced us that we had found a route that would allow us to explore, in our style, a large portion of the Alps. Click map to open an interactive CalTopo map in a new browser tab. Instructions for using CalTopo. The red line is our GTA track; the yellow lines are international borders. 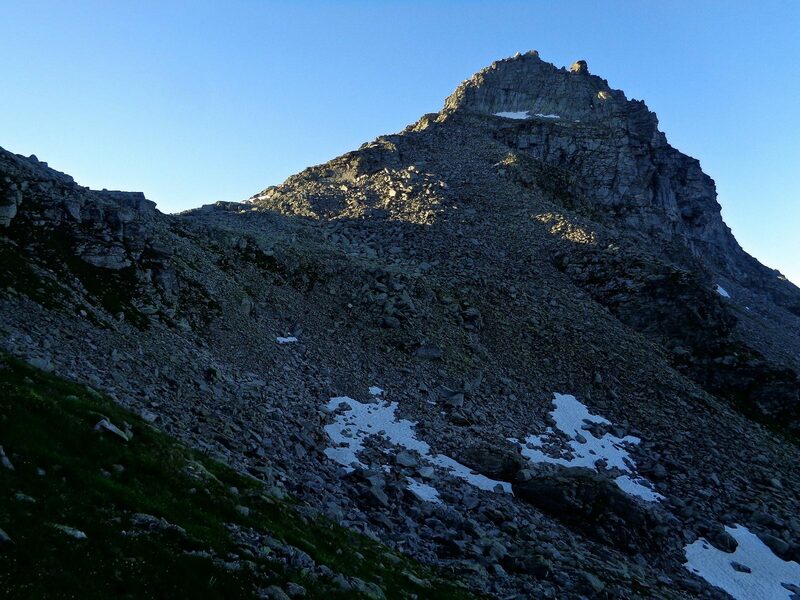 In every dimension this trip was successful: beautiful mountain scenery, good food, many great campsites, terrific wildflowers, stress-free logistics, good conversations with other hikers, good weather, fun and friendly local people, and no illness or injury. The route has great integrity, and was never interrupted by unpleasant towns, big ski resorts, tacky tourist areas, intrusive big hotels, or long unscenic stretches. 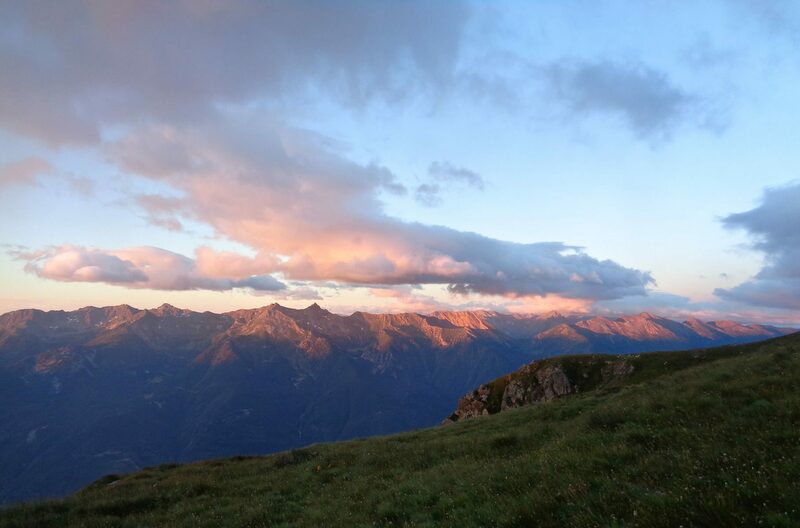 The Rother Guide introduces the GTA as follows: If you think that the Alps have been completely tamed through tourism, you will get an entirely different view while walking the GTA. On this front I was not disappointed. I admit that at the pace we maintained I was exhausted by the end. We brought that on ourselves by allocating 49 walking days instead of the 65 days recommended in the guidebook, and then pushing hard enough to complete the route in just 41 days. I spent many hours daydreaming about hiking the Thames Path. I’ll offer comments about two things we do that are somewhat uncommon in hopes of inspiring others to branch out and try something new. First, based on our own observations, it seems relatively few American hikers venture across the pond for long hiking trips. 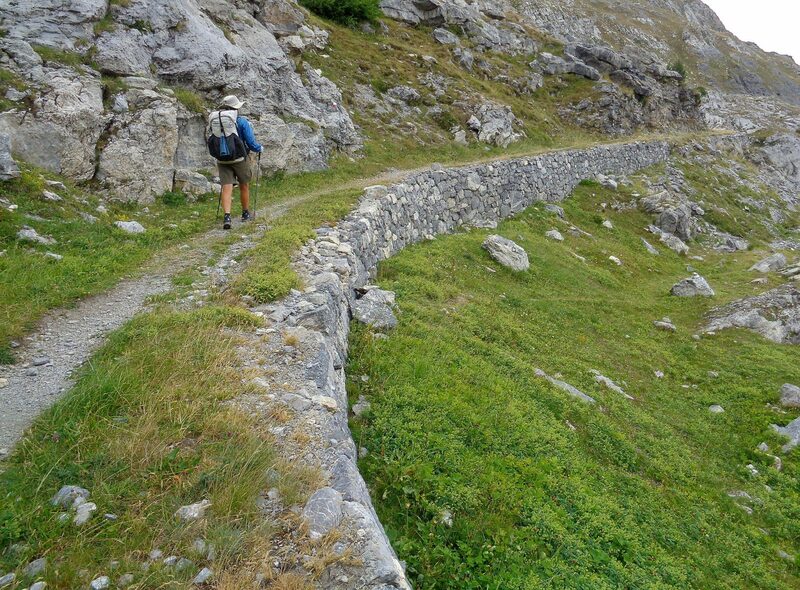 Hey American hikers, there is great hiking in Europe! If you haven’t tried it yet I strongly encourage you to spend a couple weeks and see if it suits you. It’s a very different experience and you might find, as I did, that it is a great complement to our stellar wilderness hiking opportunities. 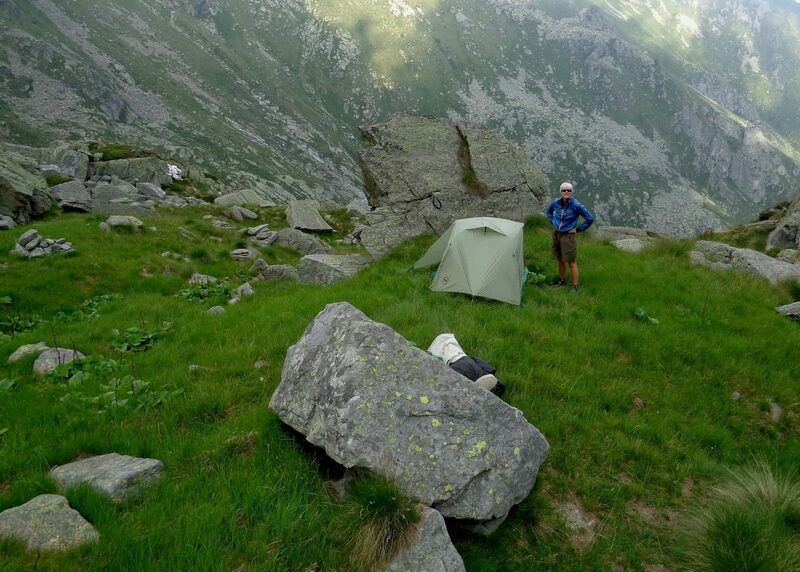 Second, it seems relatively few European hikers carry a tent on routes like the GTA. 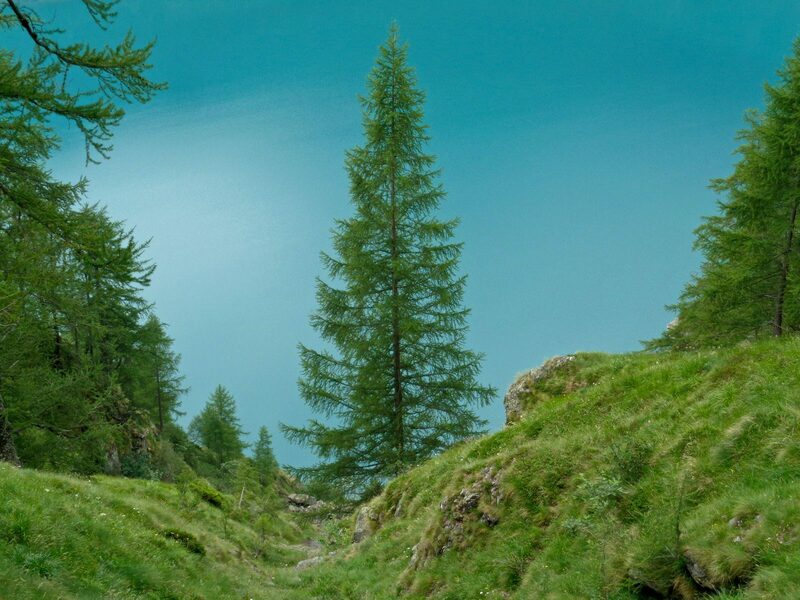 We prefer camping because it is 1) usually quieter, 2) always less expensive, 3) usually more scenic, and 4) allows us to walk as far as we like each day without being tied to a reservation. 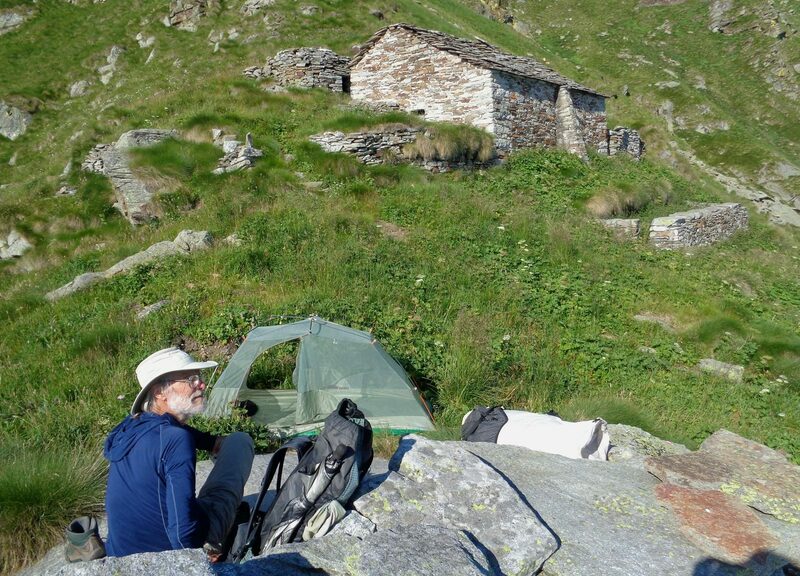 Eating restaurant/refuge meals but sleeping in the tent is a great combination, and is a viable option on this route. It is no longer burdensome to carry a tent as there is great lightweight gear available to those who know where to find it. Our packs weighed 6 kg each, plus about a kilo of food; lighter than many carried by the people who were sleeping in the refuges. This trip is not displacing the HRP on my Top Ten List. Both trips were excellent, but I tip toward the HRP because it has slightly greater scenic diversity, far better birdlife, and a higher percentage of nights spent at absolutely stunning campsites. This was a great walk. I relished almost every minute of the trip, even when struggling over yet another pass. The walking was both exhausting and exhilarating. The mountains are real mountains and I felt like I was right in the middle of them. The scenery was far better than I expected, especially considering the mid-altitudes where most of the GTA is routed. This trip went remarkably smoothly, with no significant adversity of any kind other than eating too much cheese and processed pig product. We were blessed with mostly fabulous weather and had almost no down time due to storms. 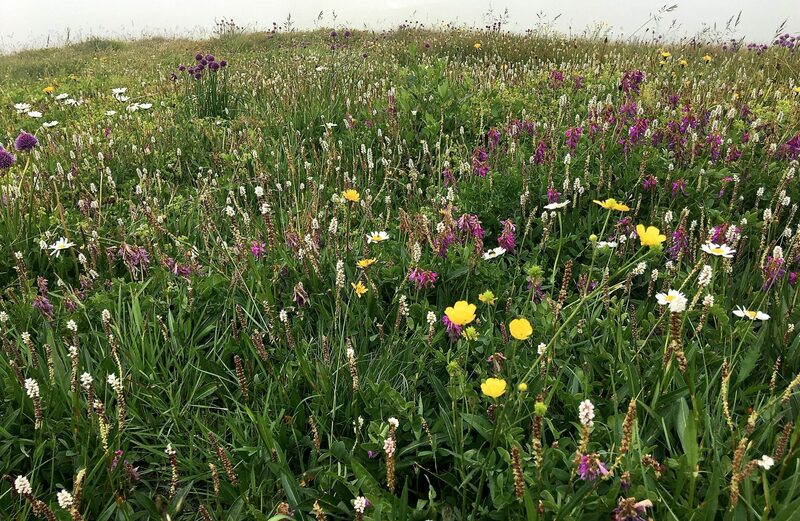 The wildflower displays, especially during July, were as diverse and colorful as any I have ever seen in the mountains. I enjoyed our pace and the sense of moving through a landscape. Looking out from each pass into the distance, I knew that in days, or sometimes weeks, we would pass that distant peak on the horizon we could now barely make out. 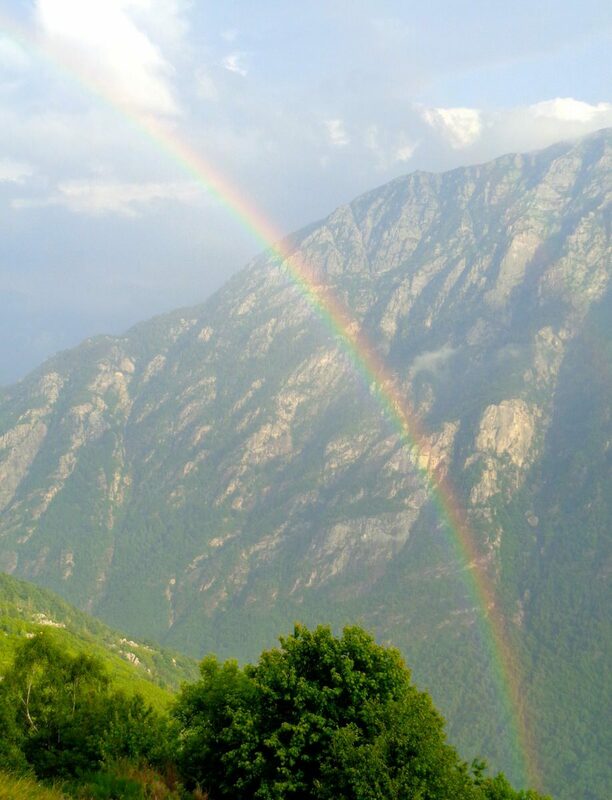 We had some great campsites, including one on the porch of the pilgrimage chapel of Sant’ Anna perched high over a deep valley with an amazing cloud and rainbow light show playing out on the opposite ridges. The Italian people were uniformly friendly, gracious, helpful and fun to be around. The refuge staffs were generous with their time and tried to meet our food needs as best they could. 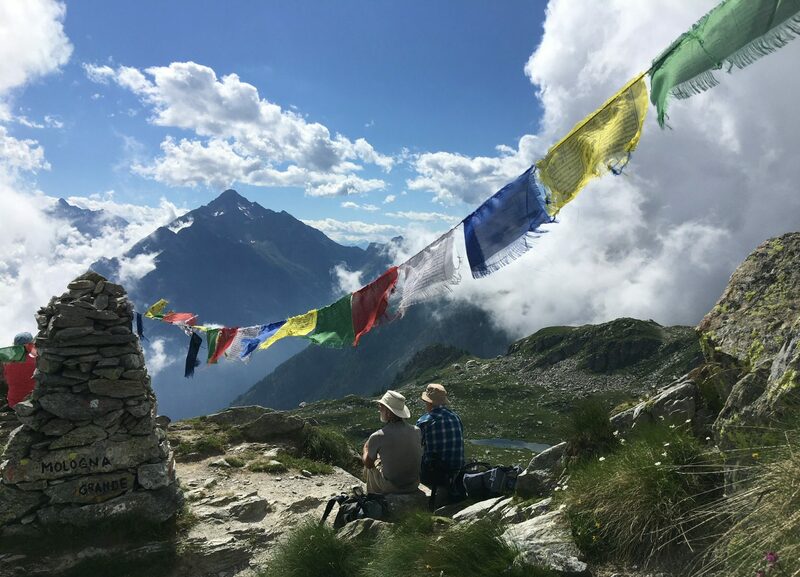 I savored the conversations we had with some of the other hikers we crossed paths with, even though language difficulties made exchanging thoughts more complicated. The only negative, besides a lack of birds, is that these mountains were not quite as magical as our home range, the Sierra Nevada. Shortly after returning from the GTA, I took a four day hike in the Hoover Wilderness and was reminded, once again, just how deeply satisfying the Sierra is. 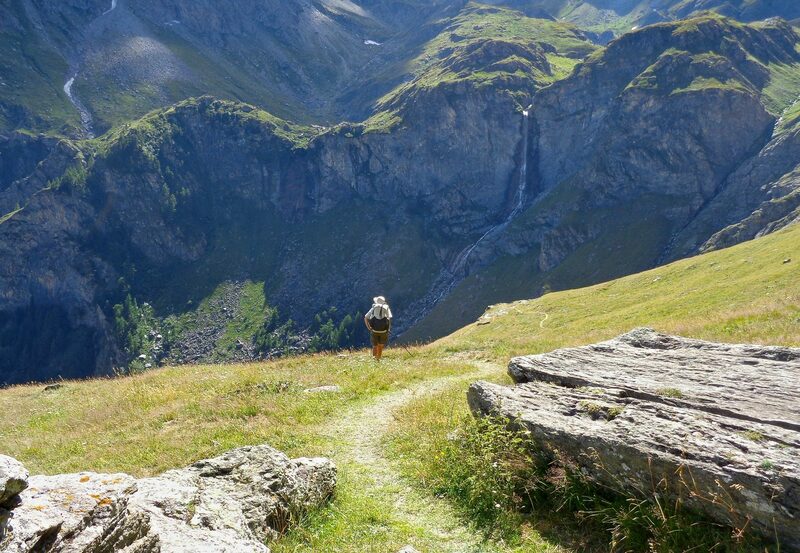 No mountain range that I have ever visited has been its equal as a place to backpack. 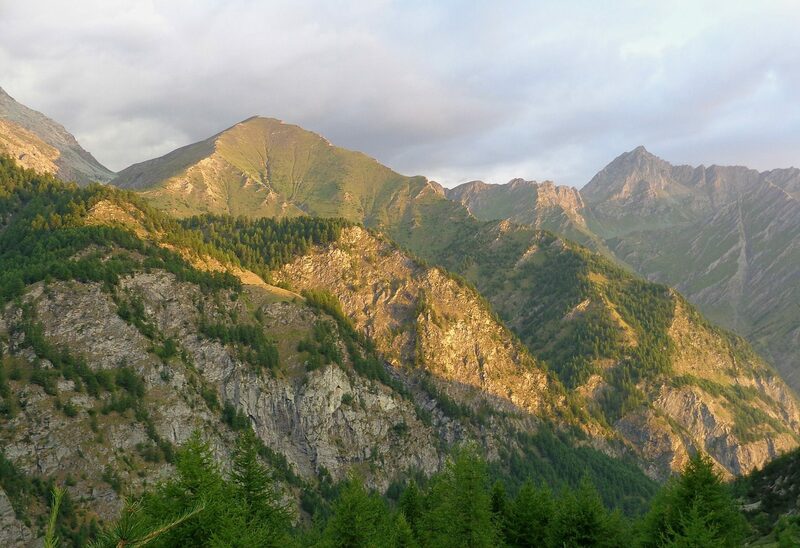 This is not meant to imply that there are no other fine mountains to explore and the Italian Alps were absolutely worth the time we spent there. However, the Sierras remain my favorite backpacking mountains. In summary, the GTA walk was a fine and rewarding trip and I certainly encourage other backpackers to give walking it serious consideration. I believe that you will not be disappointed. 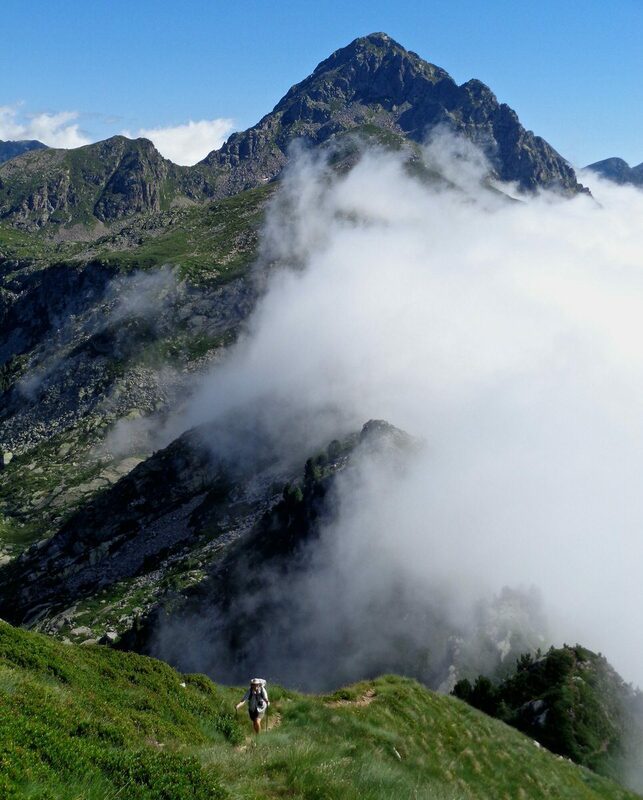 Italian hiking clubs laid out the GTA in the 1980’s to develop a counterpart to the French GR5. 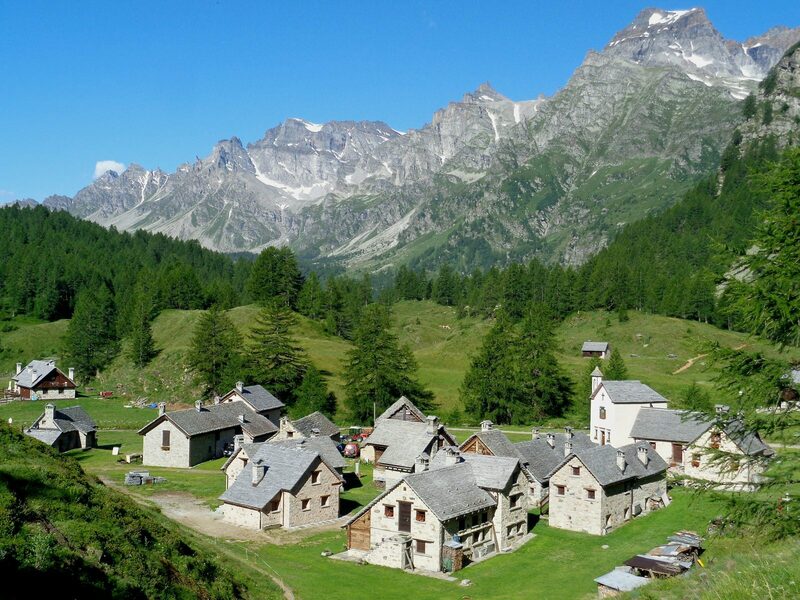 The route was partially created in an attempt to bring tourism dollars to areas in the Italian Alps that were rapidly depopulating due to economic changes. 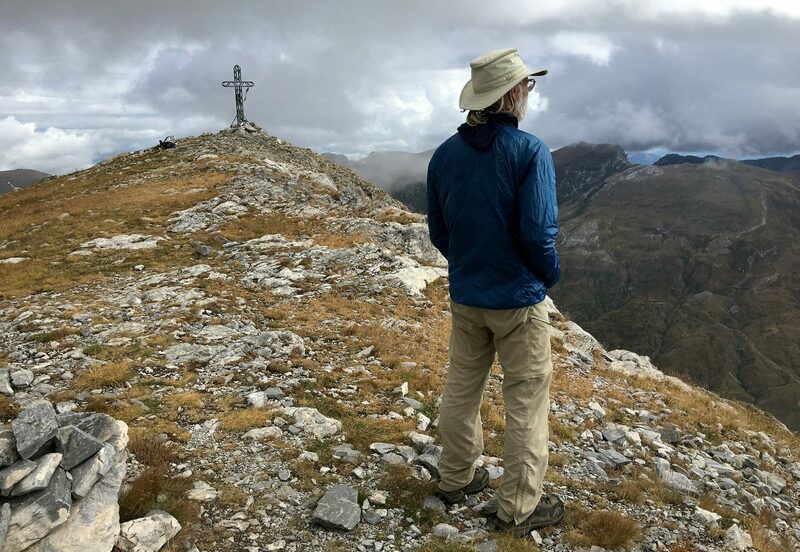 While the GTA initially generated some interest in Italy, most Italian hill walkers do not undertake long-distance hikes and the walk dropped into obscurity. German hikers eventually re-discovered the GTA and in 2010 Rother commissioned a new guidebook to be written in German, which was subsequently translated into English. The original GTA itself was actually more of a concept than a formally defined route like the John Muir Trail. There are several starting and ending points and many variants along its path. The Rother authors, Kürschner and Haas, introduced new end points. They chose the Mediterranean Sea as one obvious terminus for the GTA. Since the Alps drop down to the water’s edge, this made more sense than ending at some random inland town. 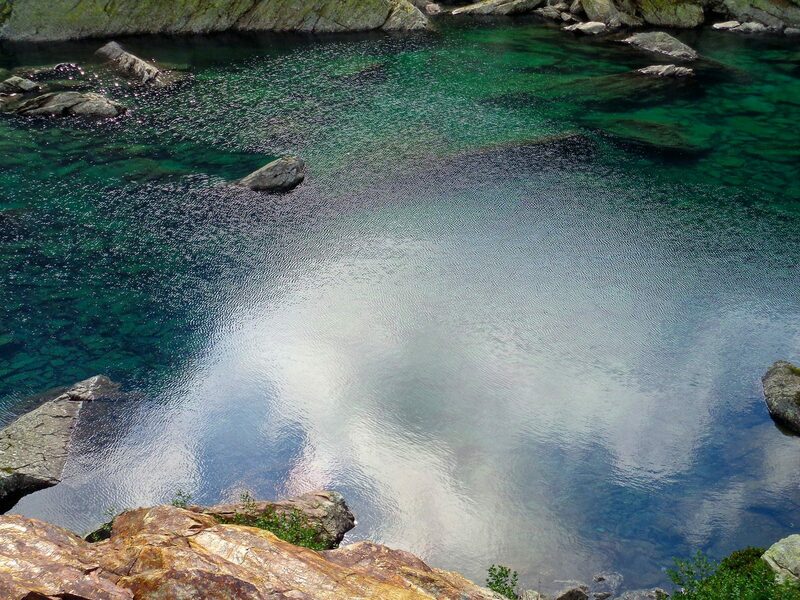 For the other end, they selected the most northern point in the Italian Piedmont. Since the route is almost completely within the geographic Piedmont region, this also makes sense. Kürschner and Haas eliminated many of the variants, simplifying the route choices a walker confronts. Purchase of the Rother Guide provides free access to an up-to-date GPS data that includes the track and hundreds of useful waymarks. Because of their work, the GTA is now more of an internally consistent route and is essentially “plug and play” for English or German speakers who want to walk it. 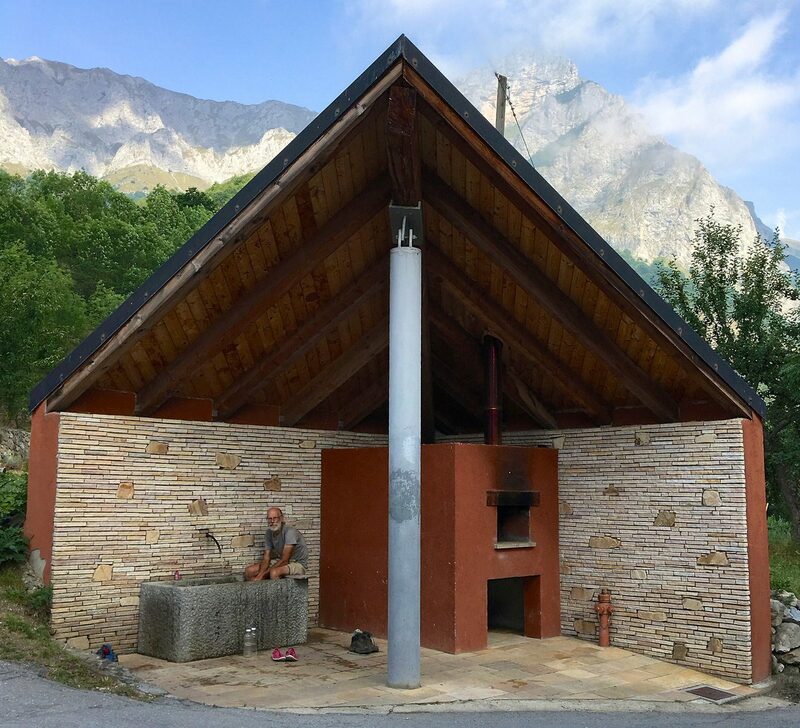 Like many guidebooks to long European trails, the Rother guide divides the GTA into daily stages, at the end of which is some form of lodging: mostly refuges, but also posto tappas, albergos, and a few hotels. Well over 95% of the over-night hikers we met walked from lodging to lodging and did not carry a tent. Each stage can be walked in a day and with only one exception, meals can be obtained at the stage endpoints. 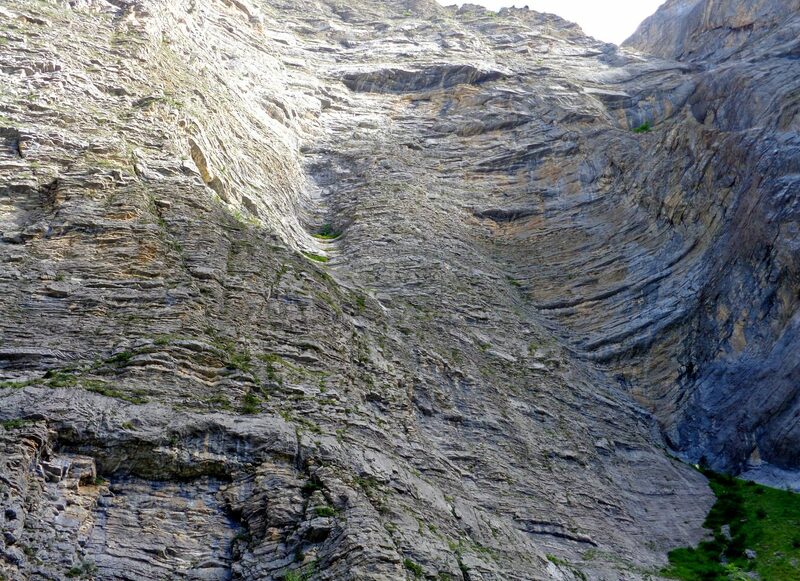 The Rother guide has 65 stages, almost all of them less than 20 kilometers in length. 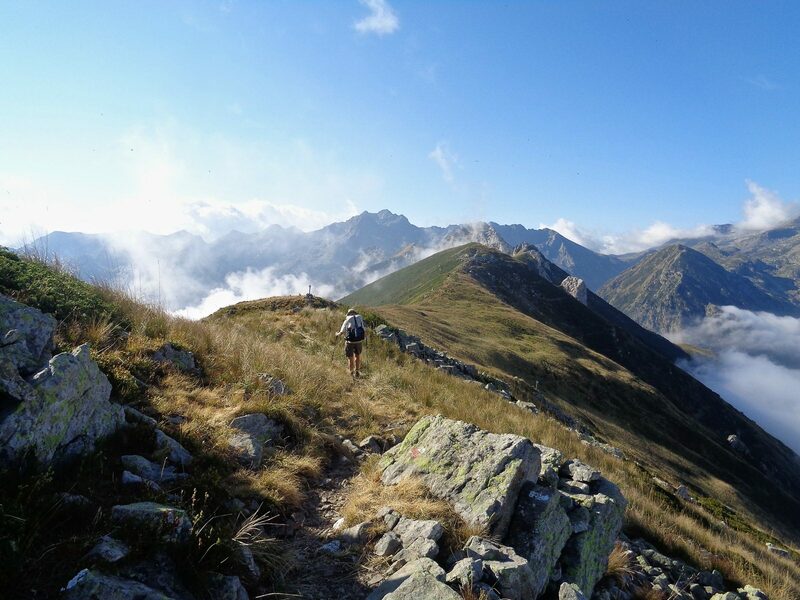 The route is further subdivided in groups of consecutive stages, each walkable within a week’s timeframe and all with public transport at the beginning and ending points. Most of the GTA hikers we met were hiking one or two one-week sections; many of those people had already hiked other sections in prior years and some people planned to hike all of them over the course of multiple years. Thru-hiking the entire route in one year is unusual and we did not speak to anybody who had met a hiker who had completed the whole trail in a single go. As the Rother guide states: “Only a very few will trek the entire GTA in one go.”. 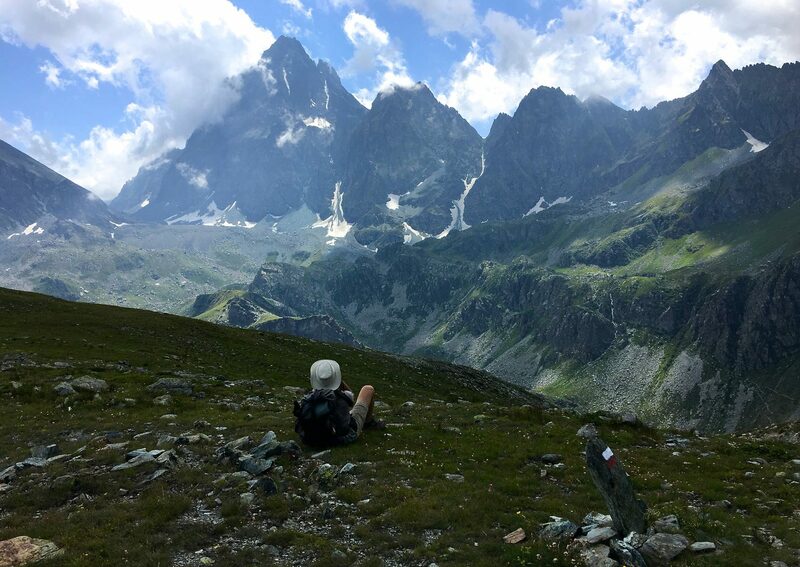 The GTA is certainly not as well known, even in Europe, when compared to the Tour Mont Blanc, some of the popular GR routes, or the Via Alpina routes. Most local residents we spoke with knew it passed through their area, but rarely knew where it started and ended. We have not encountered any Americans who know that it even exists. 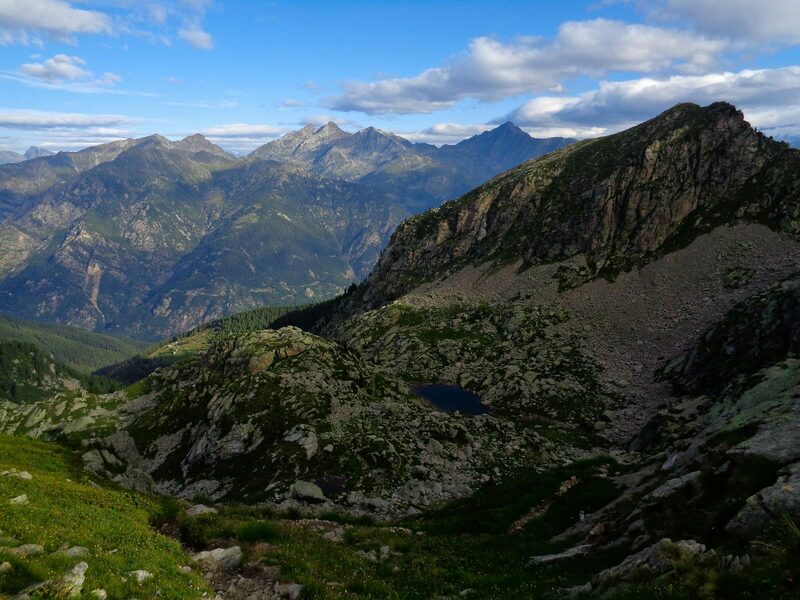 The other two European trails that we have hiked that are most similar to the GTA are the Haute Route Pyrennees (HRP) and the Alpe-Adria Trail (AAT). 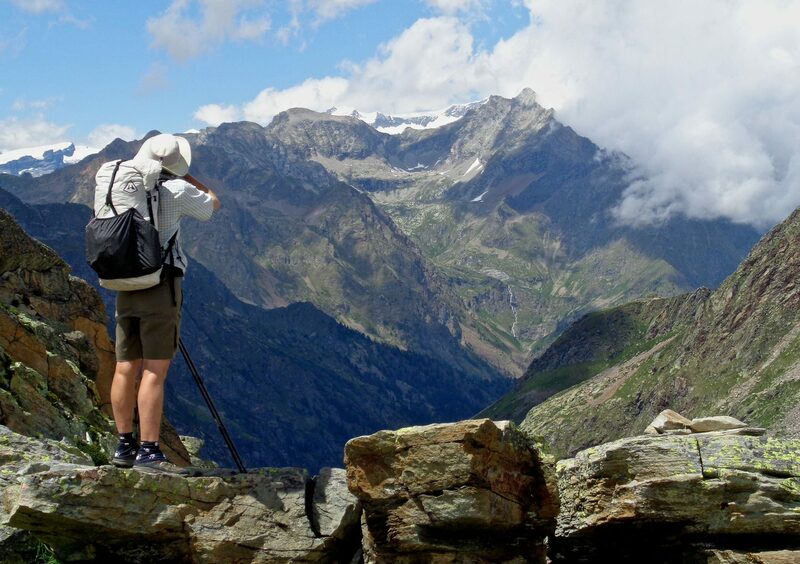 All three are multi-week routes through mountainous terrain with good guidebooks. 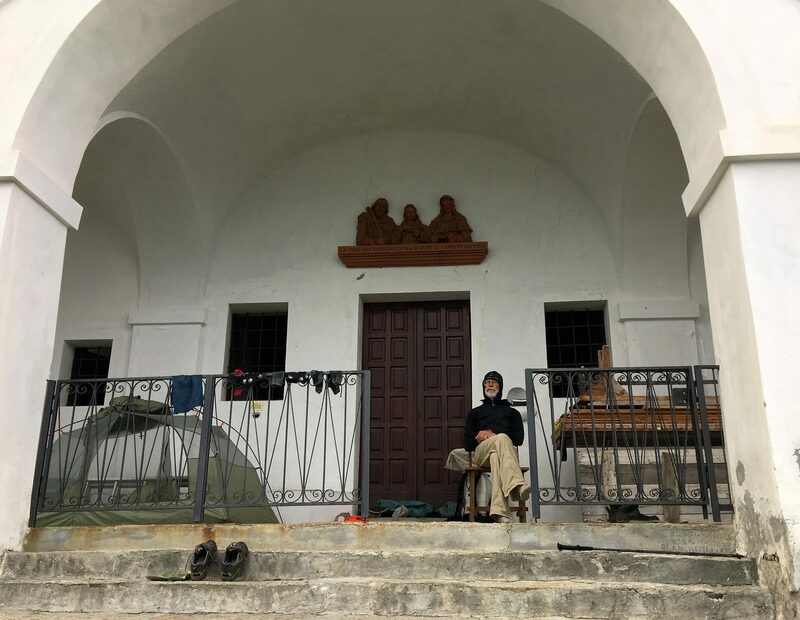 All three have accommodation and meals available at the end of nearly every stage, although we opted to sleep in our tent on all three of our trips. The GTA was the most strenuous due to elevation gain and loss. Although the HRP did not have as much daily gain and loss, there were a few places where it was moderately more challenging than the GTA due to snowfields or rocky class 2 passes. The quality of the trail tread on the AAT was significantly better than the others, but overall the scenery on the AAT was not as satisfying as the HRP or GTA. The scenery on the HRP was the most diverse of the three although the grandeur of the HRP and GTA are an even match. Overall trip logistics and access to refuges was similarly easy on all three routes, although we carried more food on the HRP because the distance between grocery stores was greater. The cultural diversity on the HRP (Basque, French, Spanish, Andorran, Catalonian) is matched by the diversity on the AAT (Italian, Slovenian, Austrian). The GTA is the least culturally diverse as it is essentially entirely in Italy. We highly recommend both the HRP and the GTA. The AAT was satisfying, but overall we did not find it as stellar as the other two routes. The southern terminus of the GTA is in Ventimiglia, Italy. 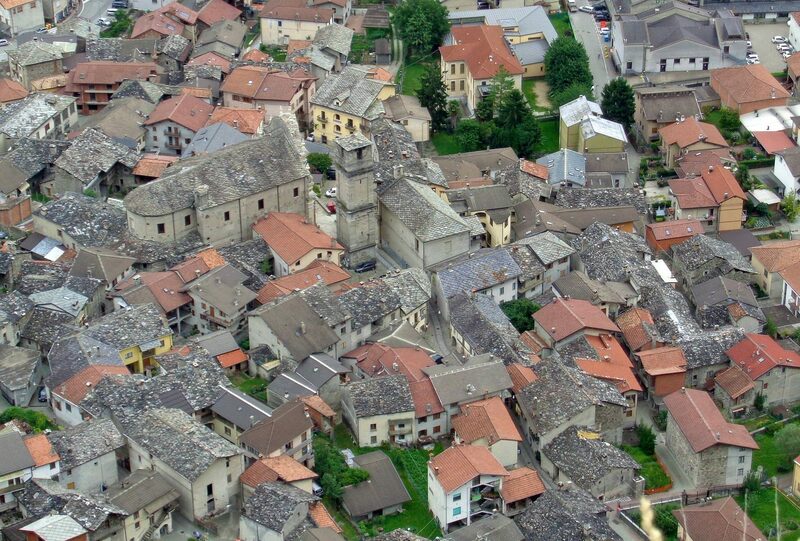 This tourist town is unmemorable, but it has good rail links to both Italy and France. 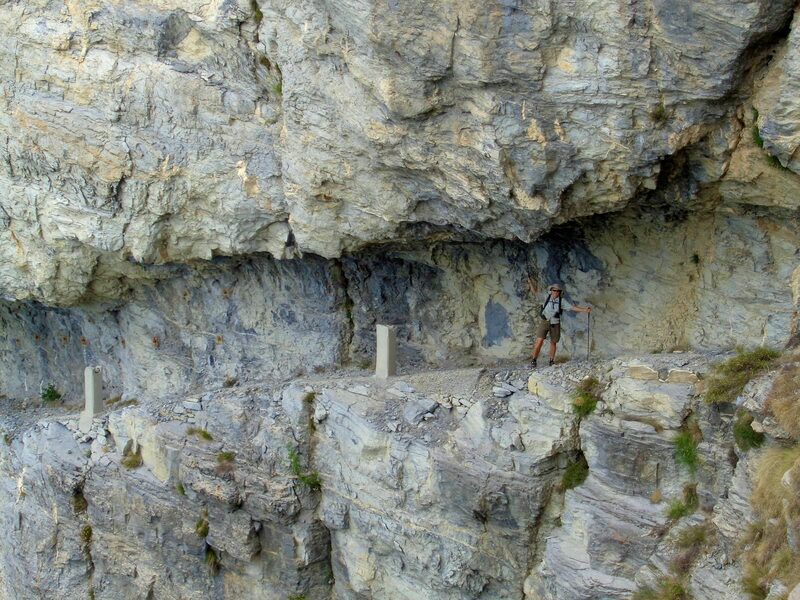 The northern terminus is a bus stop at Alpe Cruina in Switzerland. The Swiss Poste Bus 111 runs several times a day between Airolo and Ulrichen Switzerland and will stop at Alpe Cruina on request; both towns have frequent rail connections to cities in Italy and Switzerland. 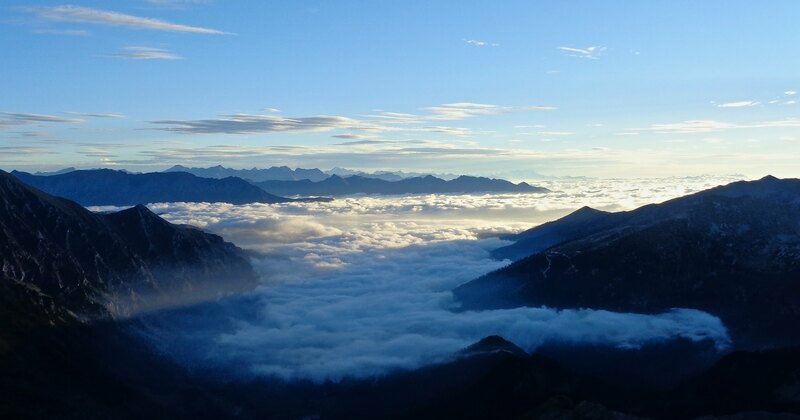 We flew to Milan and easily connected by train to Airolo where we spent the night and took the early morning bus to Alpe Cruina. We completed the walk at Ventimiglia. 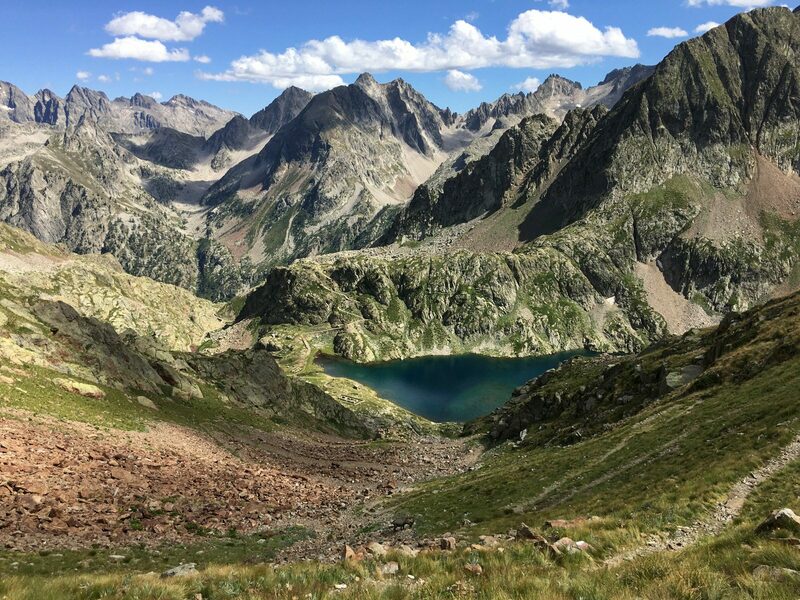 From there, we spent an additional week hiking in the Maritime Alps until it was time to return to Milan for our flight home. 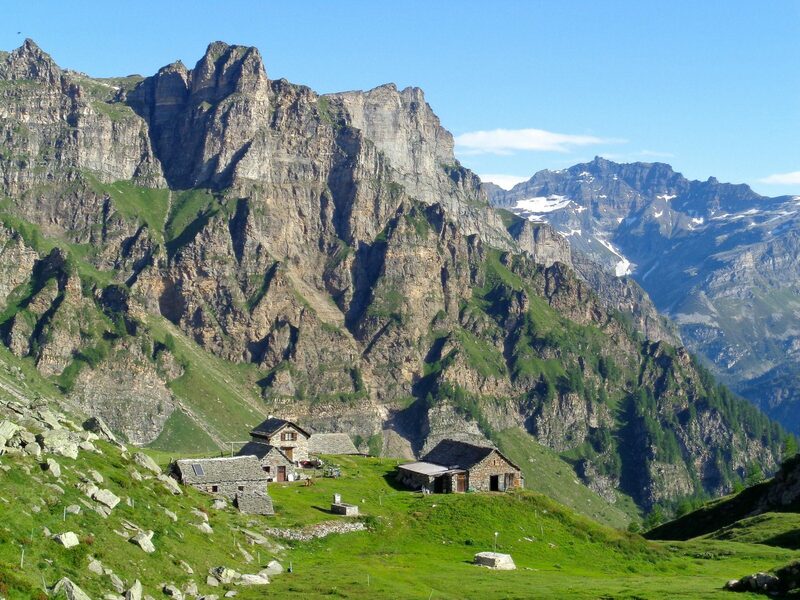 Although Alpe Cruina is actually in Switzerland, the GTA stays almost completely in Italy. In many places it is quite close to either the Swiss or French border and there is about a day or two of walking in Switzerland. 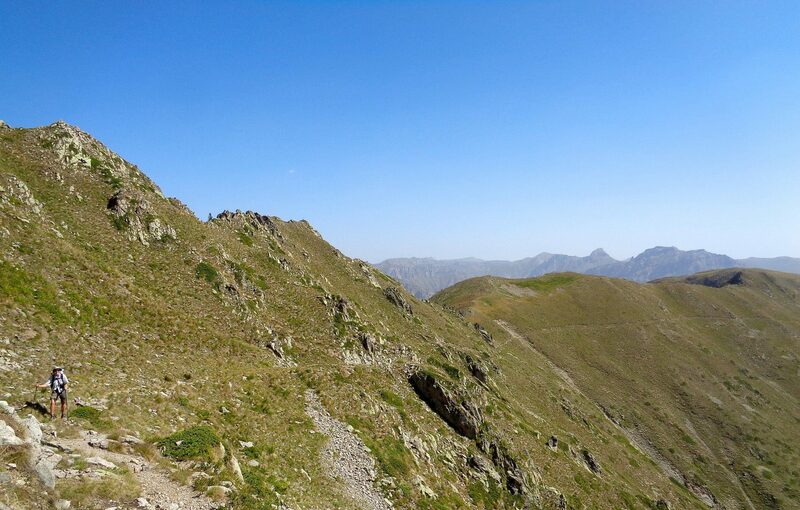 Apart from the Mediterranean terminus, its low point is about 300 meters in altitude and its high point is about 2800 meters. 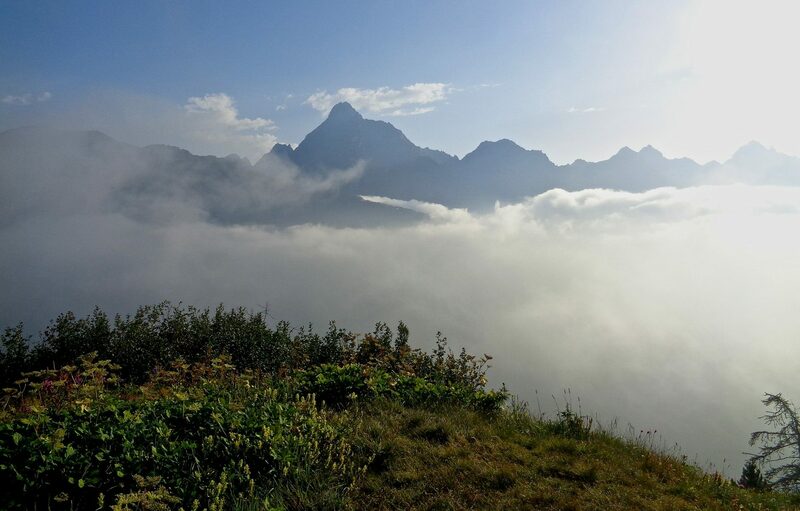 Most of the GTA is between 1200 and 2400 meters, so hikers who suffer from altitude sickness should not have difficulty with this problem. 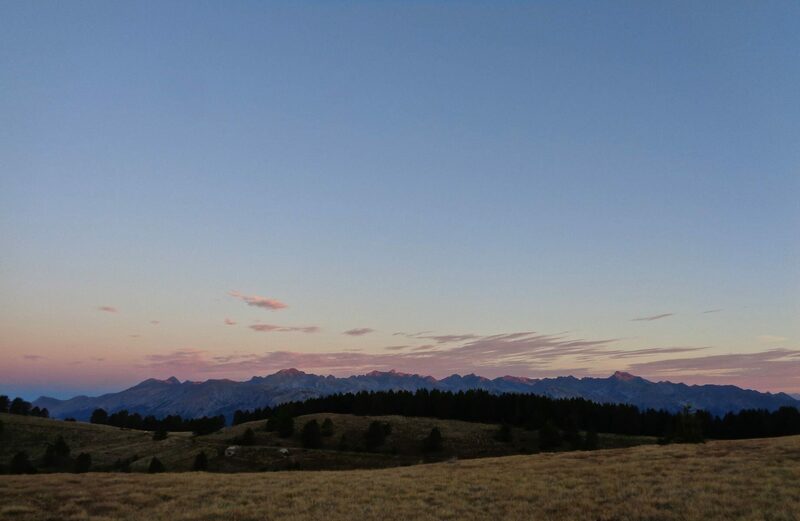 While these altitudes may seem low, the mountains are big as they rise sharply from the Po River plain that sits at or below 300 meters. 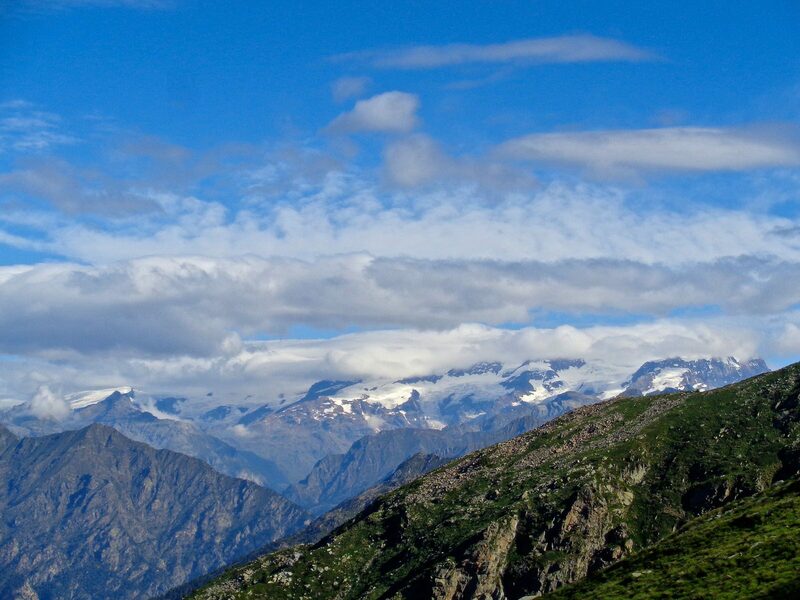 The highest alpine peaks, ranging up to 4800 meters, are easily visible just north and west of the GTA. There is an extraordinary amount of elevation gain and loss on the GTA. Based on a CalTopo analysis of our track, we gained (and lost) over 208,000 feet (63,400 meters). This works out to an average of about 370 feet per mile of gain and the same amount of loss. In contrast, the Appalachian Trail is about 240 feet/mile, the John Muir Trail 220 feet/mile, the Pacific Crest Trail 160 feet/mile, and the Continental Divide Trail 130 feet/mile. 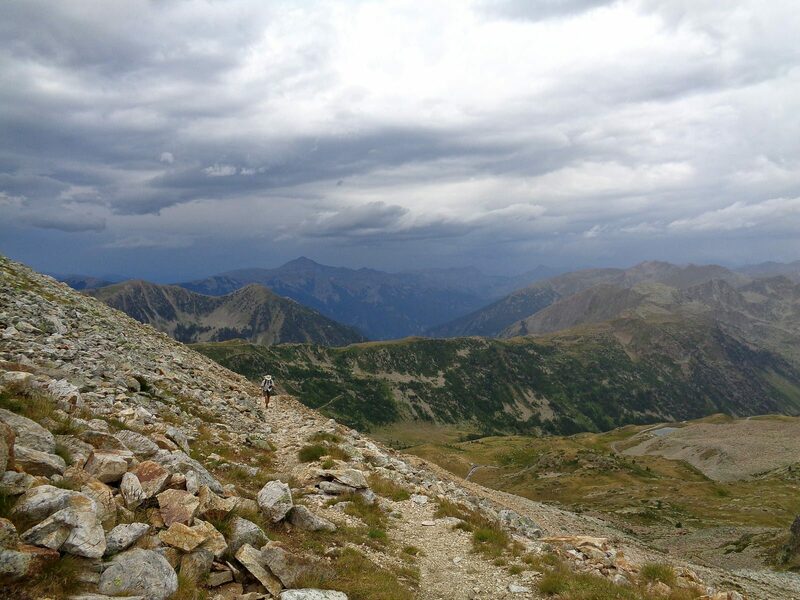 This meant that we averaged over 5100 feet of gain per day for our 41-day hike on the GTA. 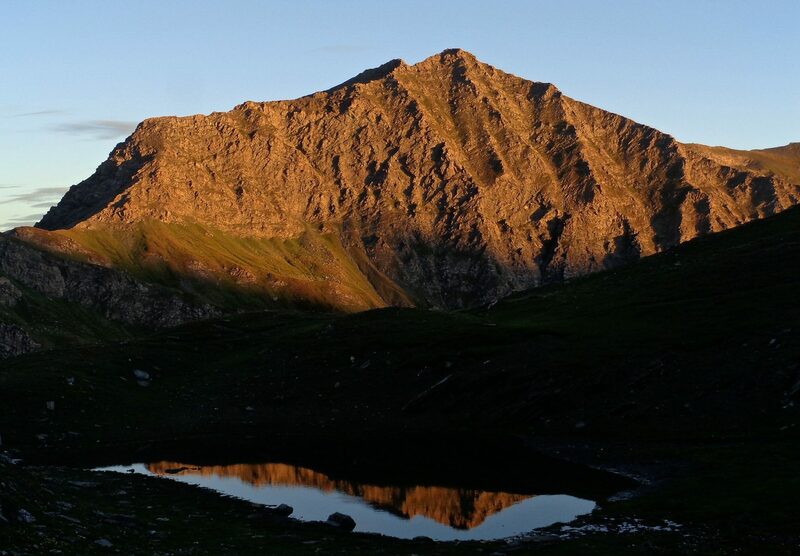 Hikers who follow the Rother guide’s daily 65 stages would have less gain and loss per day, but they would encounter the same steep trails. 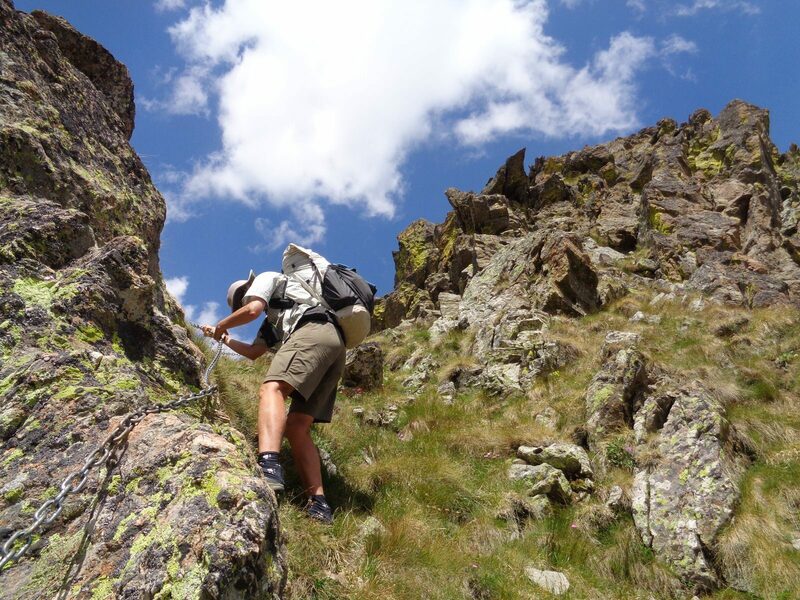 As an example, the three kilometers of trail approaching Usseglio drops 1200 meters, one of the steepest prolonged stretches of trail we have ever encountered. The terrain is convoluted and heavily dissected by deep river valleys. 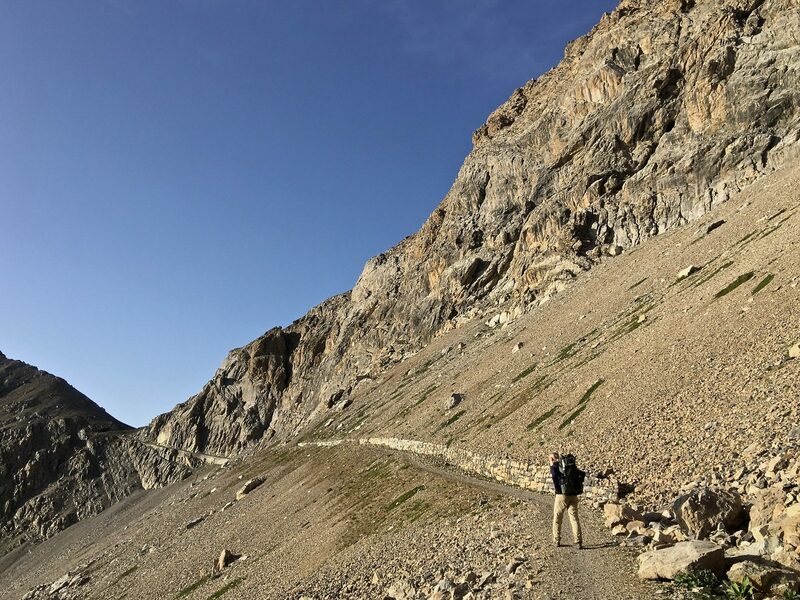 The mountains are steep and rocky, making off-trail walking both difficult and uninviting. 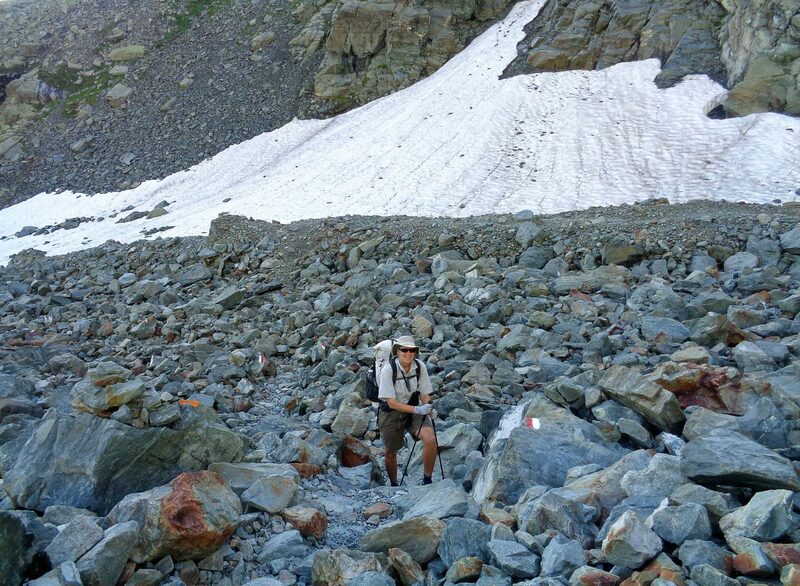 During our walk, snow was essentially gone and we crossed no glaciers. The lower portions are either forested or open grazing areas. There are only a couple of paved roads that cross the alpine crest, but roads do extend deeply into the river valleys and we touched the ends of many of them. Any significant streams or rivers are bridged and no wading is necessary. Colorful fields of wildflowers were abundant and extensive. 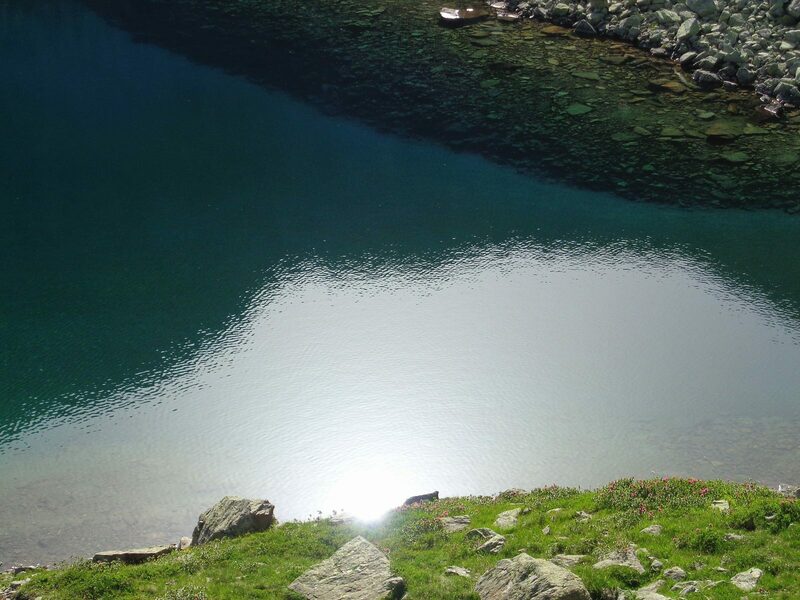 There are some lakes, but many of them are artificial or have had their size increased by dams. 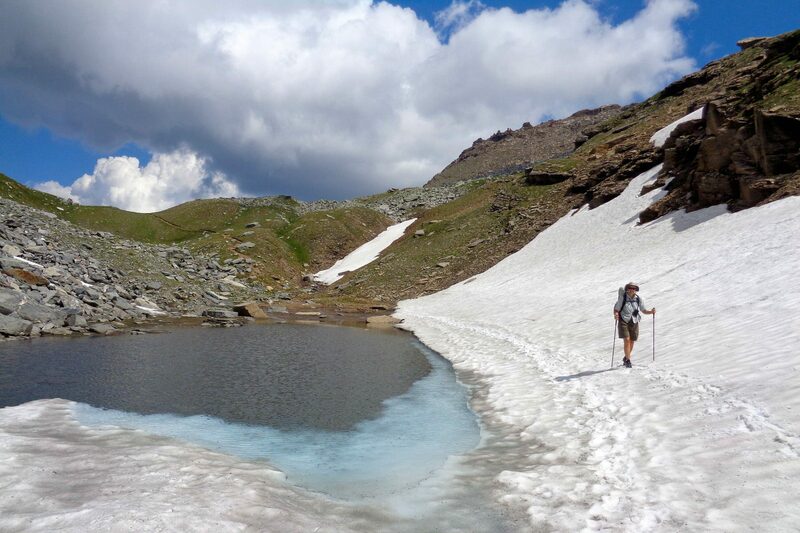 We saw surprisingly few small alpine tarns. While the GTA does not climb any of the most significant peaks in the area, it passes close by many of them. 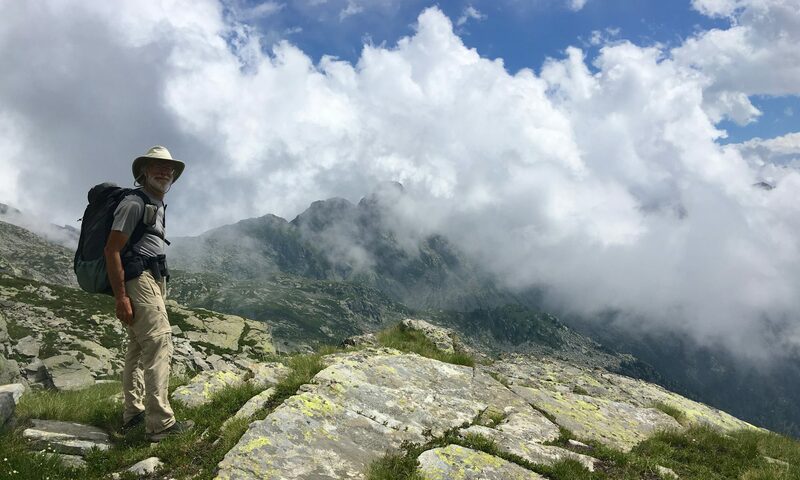 We had great views of Monte Leone, Mont Rosa, Gran Paradiso, Rocciamelone, and Monviso (Monte Viso), which was visible on the skyline for weeks. 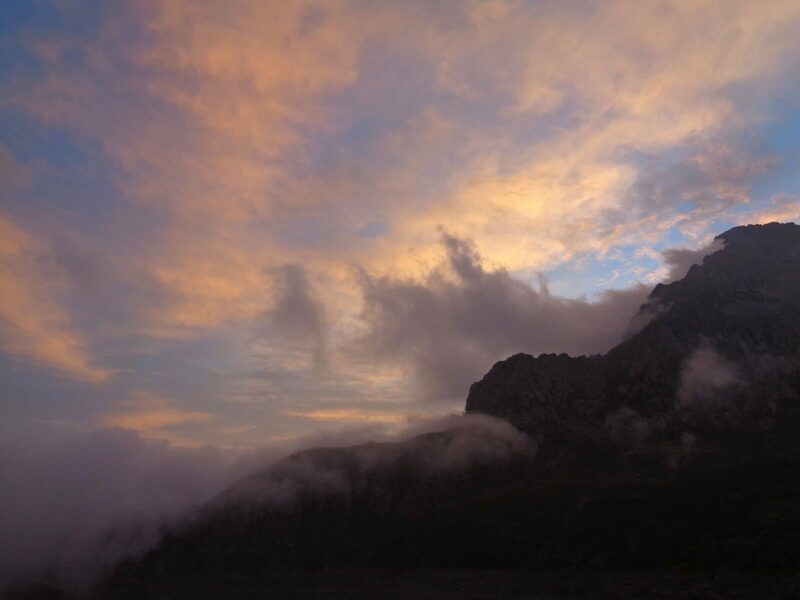 Hikers who wish to bag some summits have ample opportunity. 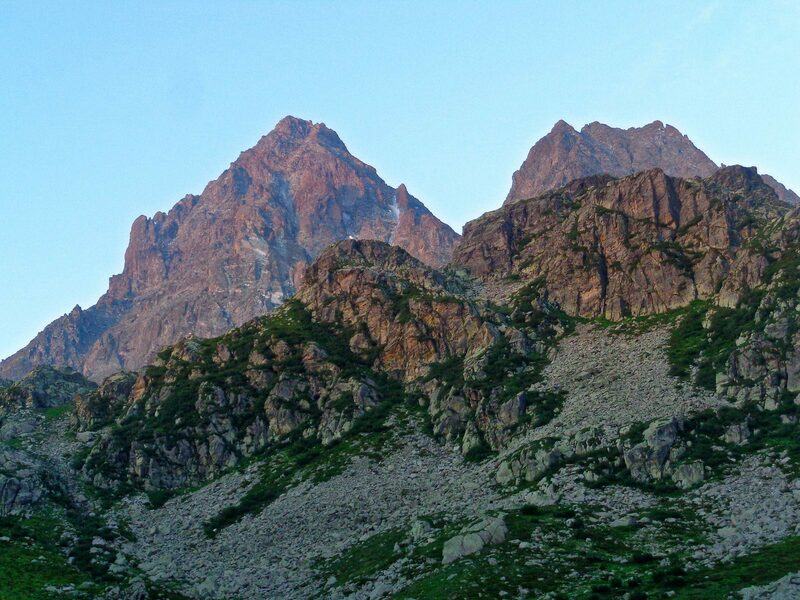 All of the larger peaks except Rocciamelone are technical ascents. The scenery is outstanding and diverse. 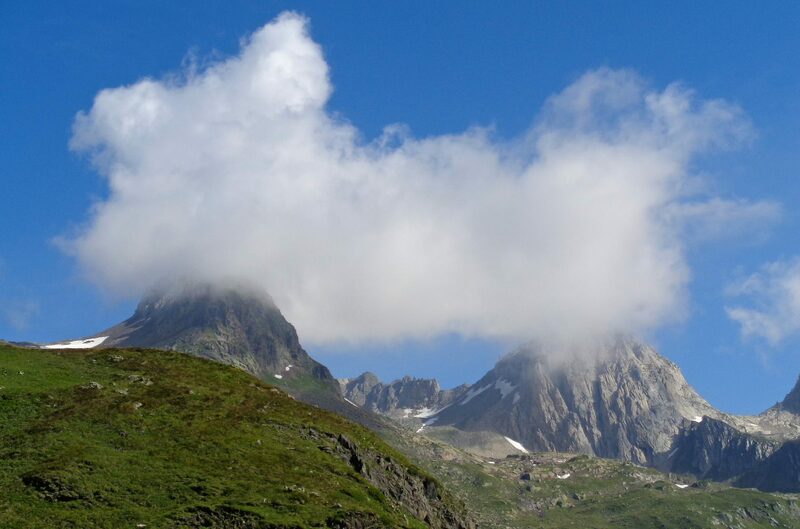 The peaks are big, dramatic and dominate the landscape. There are more forested areas today than a hundred years ago because grazing pressures are lower and most agricultural terraces have been abandoned. 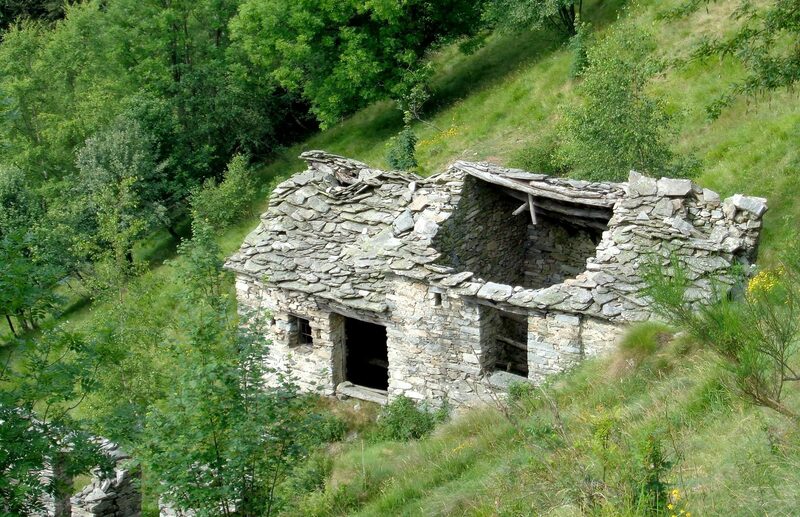 We passed though numerous deserted small settlements with the stone structures gradually falling into ruin. The significant military buildings and trails in border areas have also been abandoned with massive military installations dating back to the nineteenth century slowly falling apart. Some villages are trying to preserve ancient ways of life and are encouraging low-impact tourism. They provide food and lodging infrastructure and in some cases have started to restore and rebuild. Urbanites are also buying up properties and restoring them as weekend and vacation getaways, but mostly with respect for the existing architectural styles and traditions. 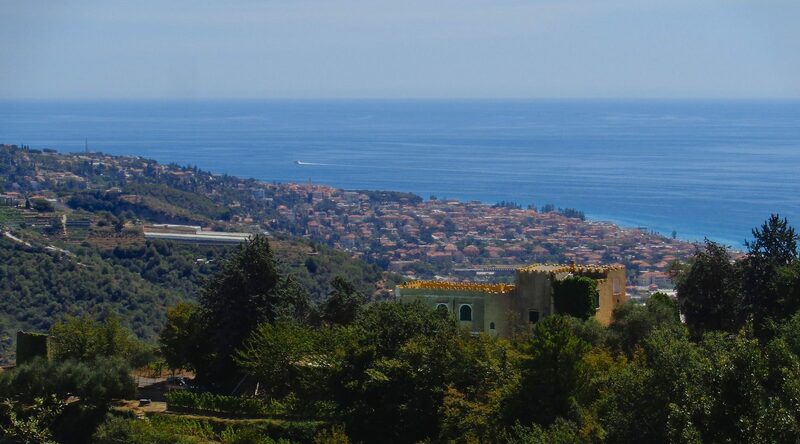 Outside of Ventimiglia, we did not see any truly tasteless developments. 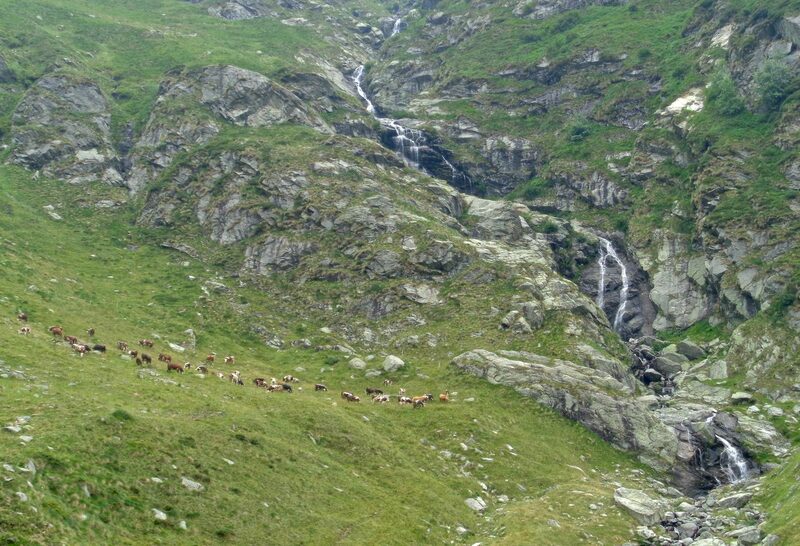 Traditional grazing is still practiced, although at a smaller scale than it once was. Cheese making is a significant source of income in the mountain villages and each location has its own unique varieties. Any logging we saw was all small scale and clear cuts were not evident. stage 7: past the Tschawinersee, the Wanderweg Zwischbergen Tschawinersee climbs higher into the mountains and crosses an attractive pass to get to the Refugio Gattascosa. This is sign-posted as the GTA on the ground. 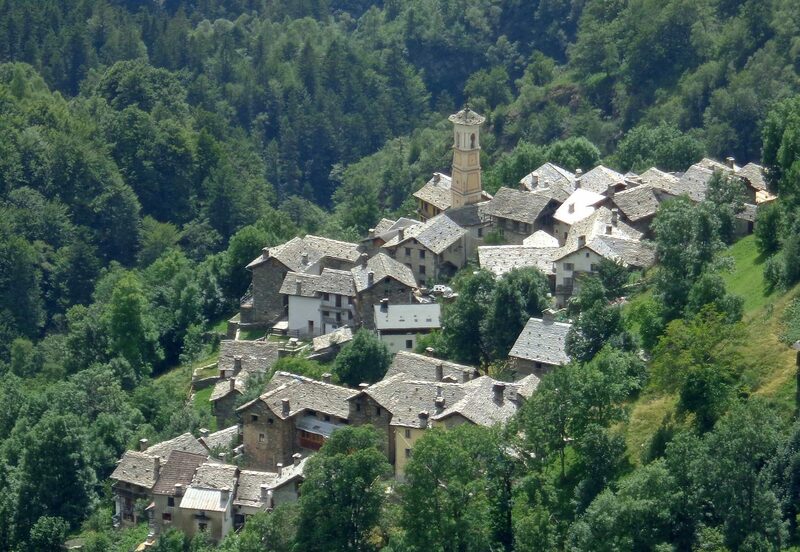 stage 25: we walked the 9 kilometers between Piamprato and Ronco Canavese instead of taking the bus per the guidebook. 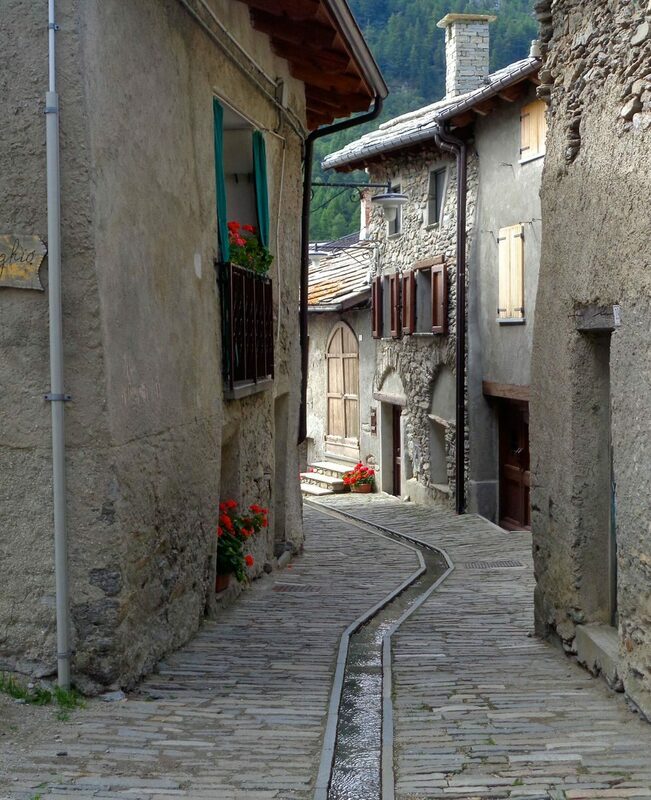 We don’t know why the authors recommend this as the walk between the two villages is mostly on a pleasant trail and the bus only runs twice a day. Their downloadable GPX file has the walking track. 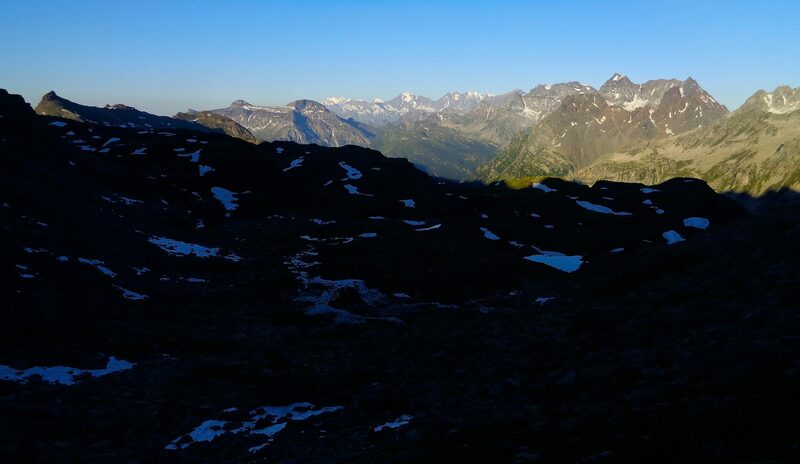 stage 37: we walked into Fenestrelle for resupply instead of the shorter route between Usseux and Laux. The next morning we walked the 5 kilometers from Balsiglia to Didiero instead of arranging a ride from the Agriturismo. This was mostly on pavement, but there was almost zero traffic. 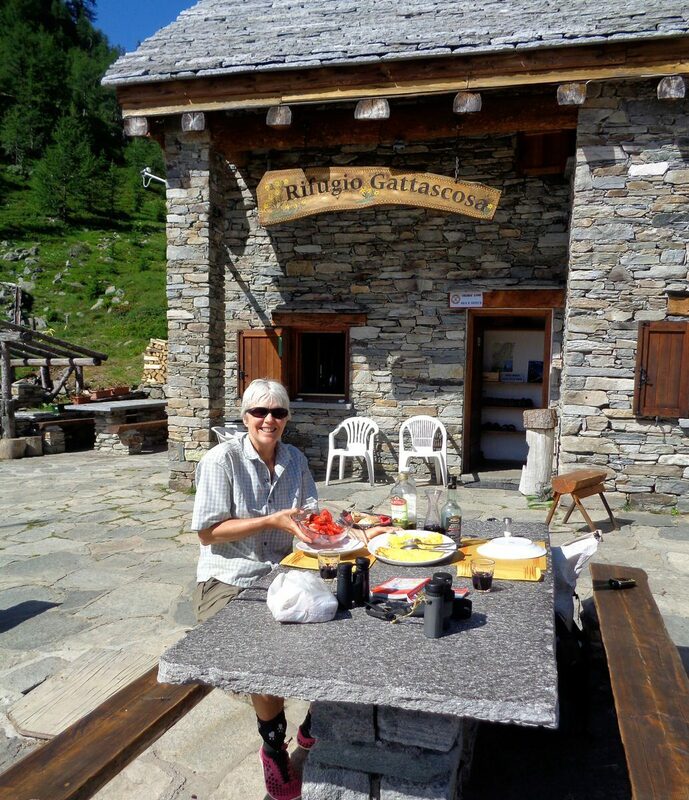 stages 39 and 40: we didn’t ride the cable car up from Ghigo di Prali; instead we took the alternate route to Refugio Lago Verde and then on to Refugio Jervis where we rejoined the main route. 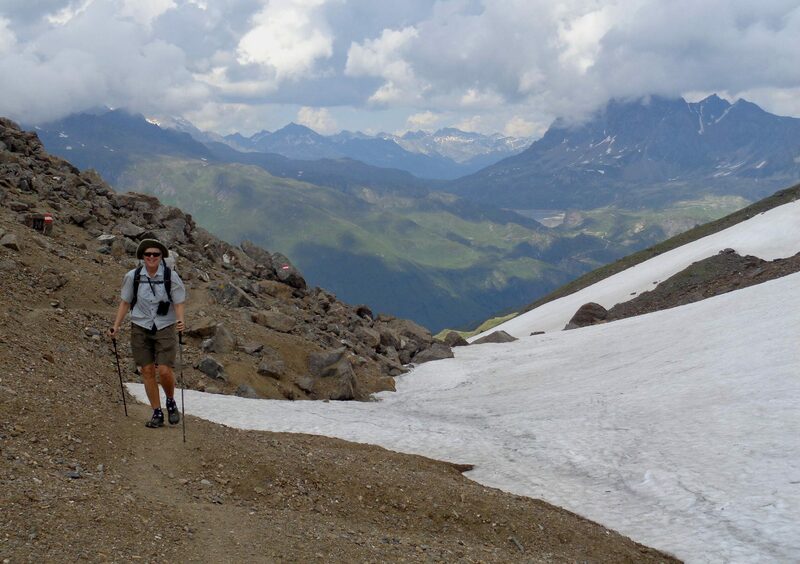 This option had great mountain walking and fabulous views. 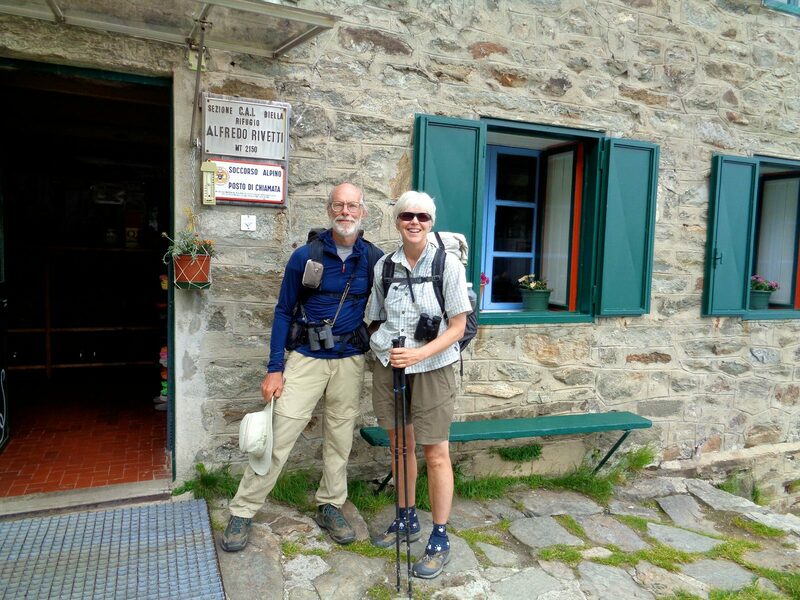 stage 41: at the Colle della Gianna, we walked the direct route via La Bellaccia to Albergo Alpini Pian del Re. 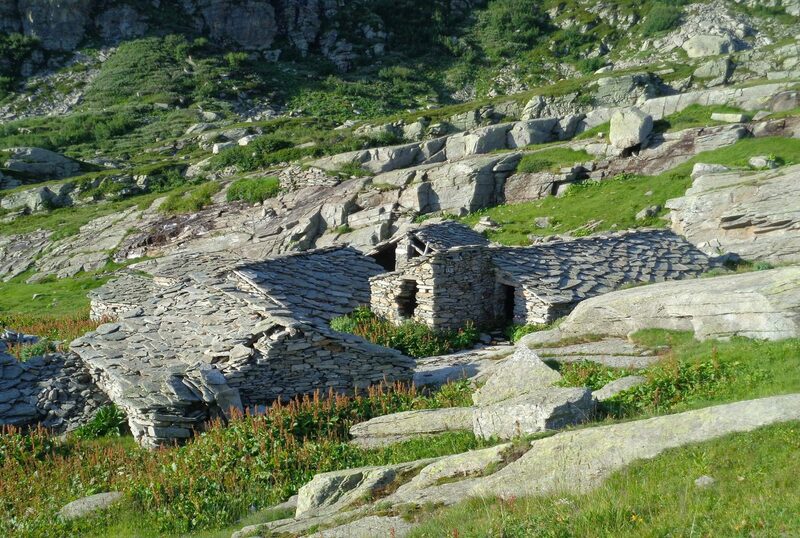 The main route dropped to Pian Melze, losing 250 meters to do so, and we had no need to visit the Refugio there. 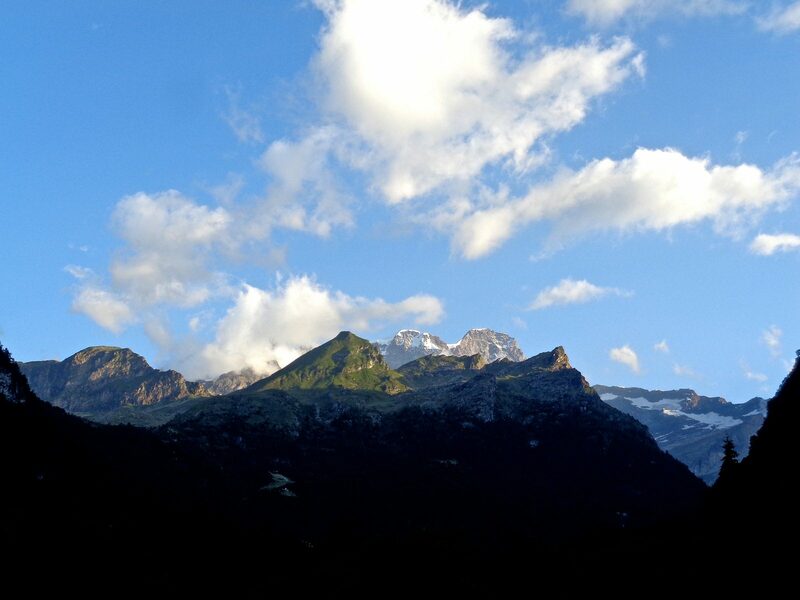 The trail we took had spectacular views of Monte Viso. 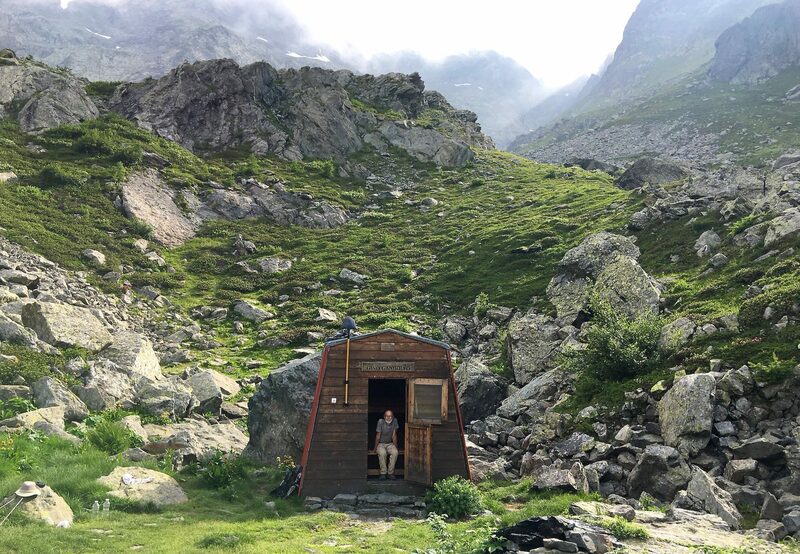 stage 42: we did not drop to Refugio Alpetta, instead we easily cut cross-country between trails for a few hundred meters at the 2460 meter level. This saved another unneeded descent and subsequent ascent. 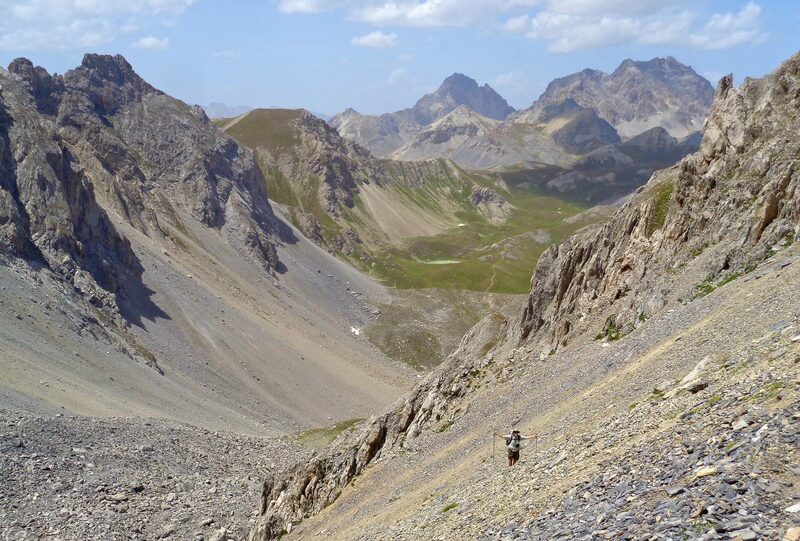 stage 44: we missed a turn and dropped down to Chiesa; this error forced to a few kilometers of extra pavement walking. 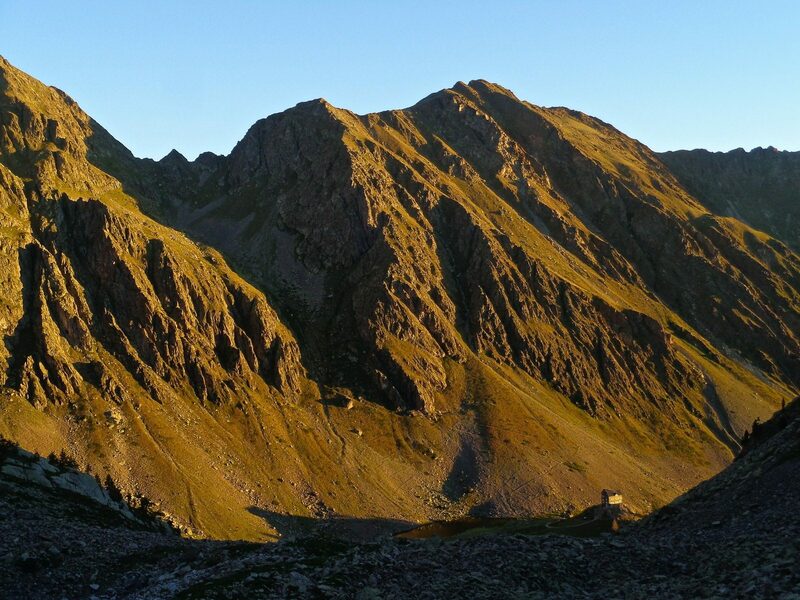 stage 46: we walked the high alternate Colle d’Enchiausa from Sorgenti del Maira instead of the low level primary so we could stay higher in the mountains. With good weather, this proved a fine choice. 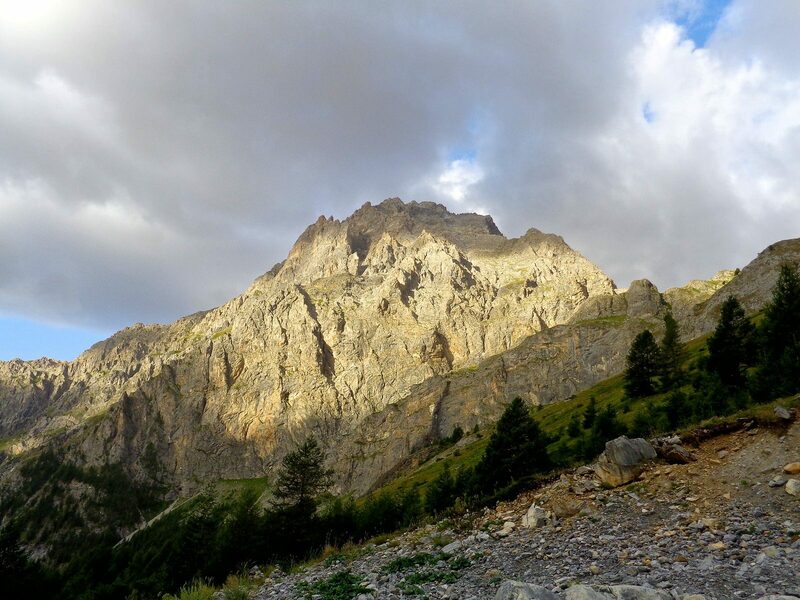 stage 49: we walked the Sentiero Balcone route from Caserma over Testa della Costabella del Piz to get to Refugio Migliorero-Strepeis. 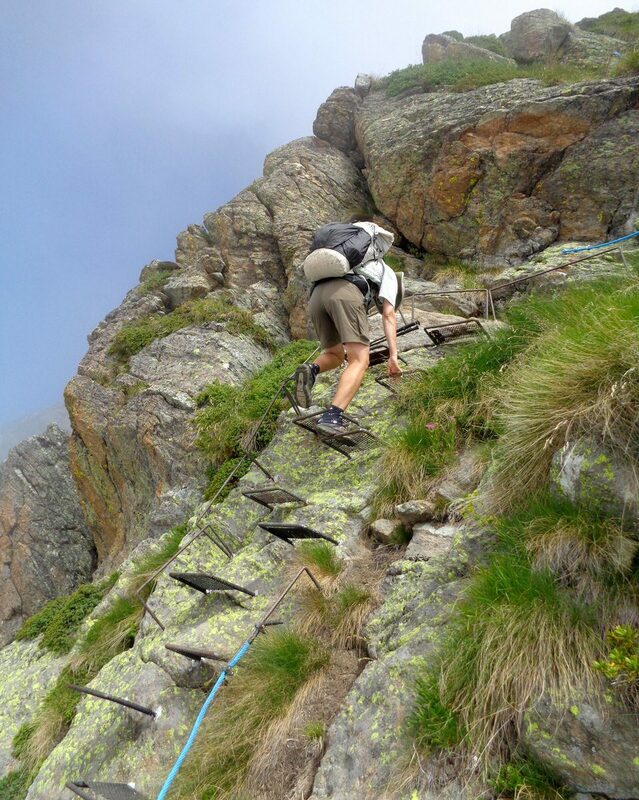 We had perfect weather and this was a fine ridge walk with a steep, chain protected (via ferrata), descent from del Piz which James enjoyed and Amy didn’t. 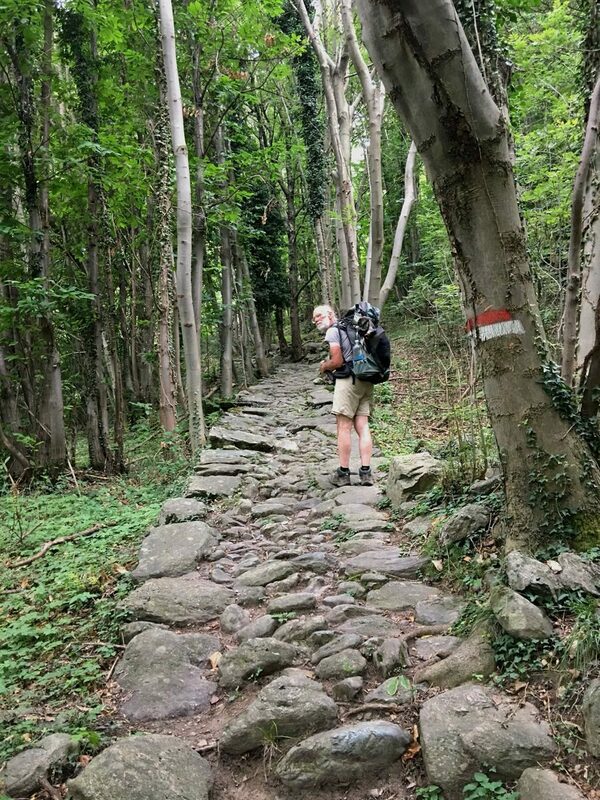 stage 51: we followed the Vallone d’Insciauda from Bagni di Vinadio to Sant’ Anna di Vinadio to save backtracking several kilometers to the primary route from Callieri. 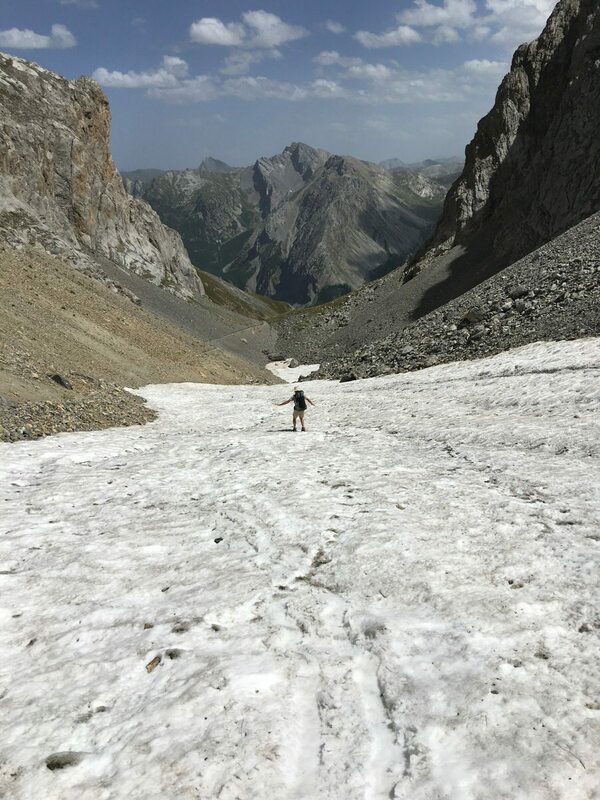 stage 62: at Monesi, we didn’t retrace our steps back to Piaggia and instead easily worked our way uphill through the open ski area and slopes above Piano del Gusso. Why the guide wants you to return to Piaggia is unclear, as there are no longer any services available there. 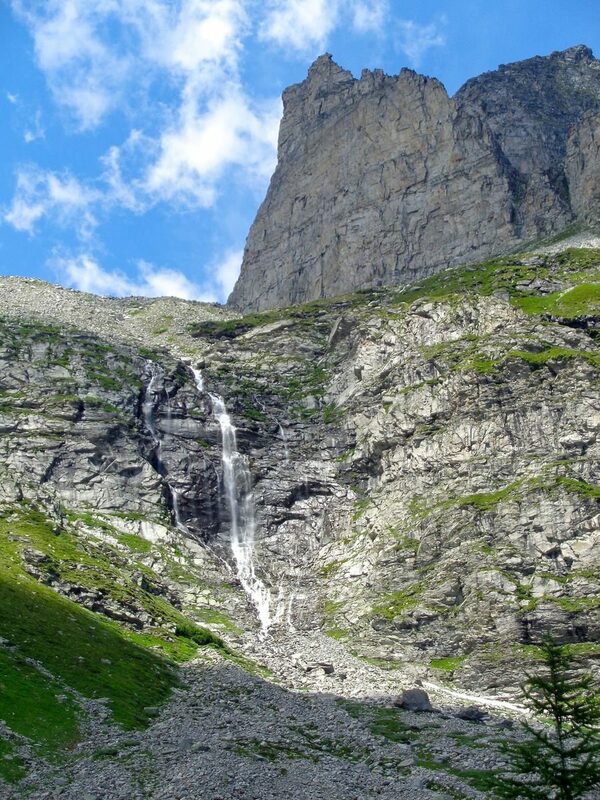 stage 63: the Sentiero degli Alpini is permanently closed by a massive landslip south of the Gola dell’Incisa. You have to take the western alternate from the Gola. 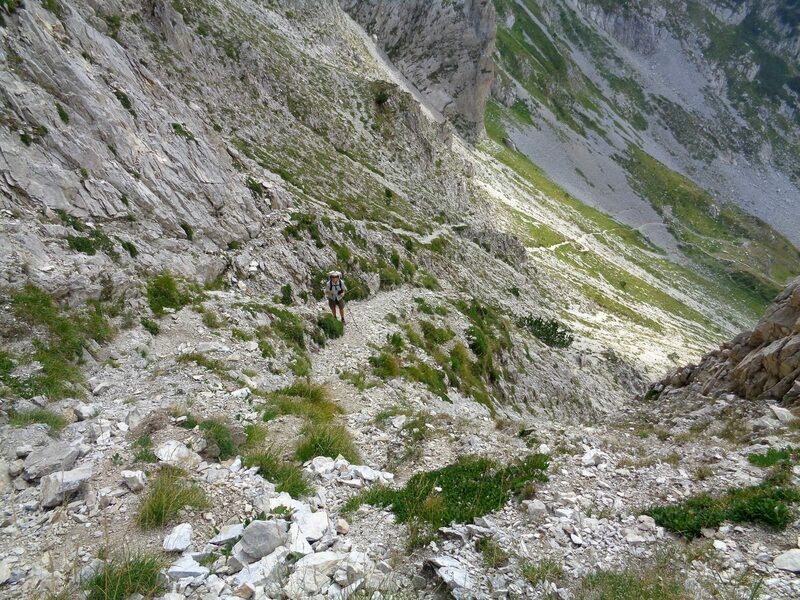 Trail surfaces varied significantly and included everything from pavement to scree-fields. Most of the route is on unpaved roads, old military or mule tracks (mulattiera), constructed footpath, or shepherd paths. Along border areas adjacent to France, old military roads predominate. These were built for use by mules or soldiers, and were not designed for motor vehicles. Although usually at a reasonable grade, the surface is frequently paved with rough cobbles and sometimes is quite tedious to walk on. These roads have not been maintained for decades and are often covered by local debris slides or have collapsed. 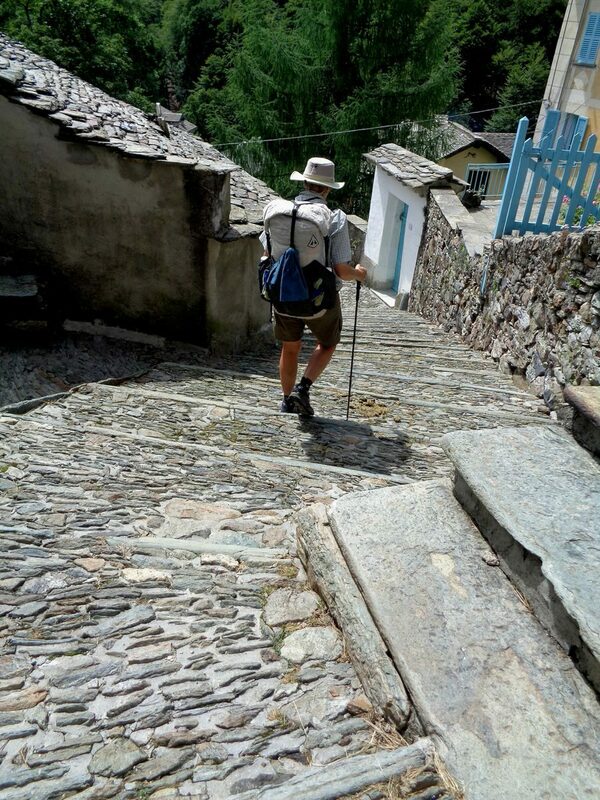 The mulattiera are traditional village-to-village paths and some date back to Roman times. Sometimes they are paved with rough cobbles forming a difficult walking surface. 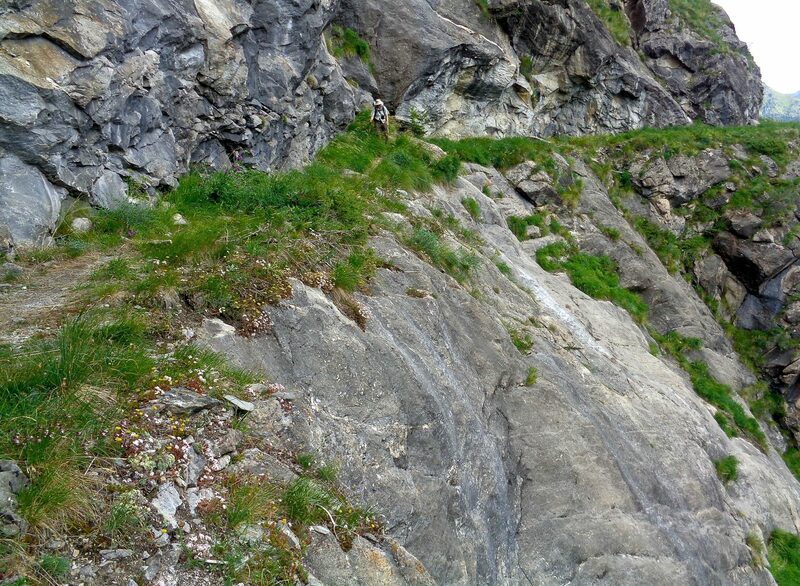 They usually go directly from point A to point B as quickly as possible and thus can be surprisingly steep. They can be very slippery when they are wet. 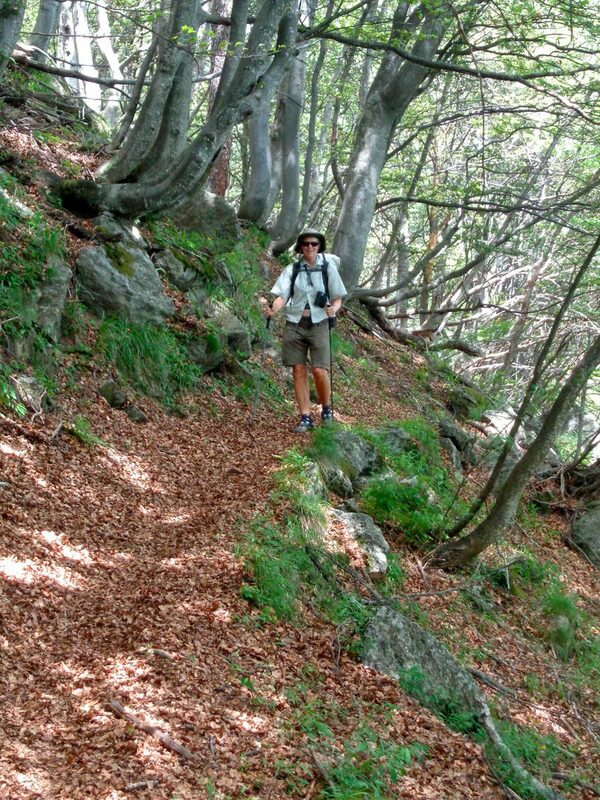 Trails vary in quality from wonderful shaded and soft stretches through Beech leaf litter to rough way-marked routes through boulder fields. The trails, like the mulattiera, are often steep and maintenance is usually not evident. Overall, walking the GTA requires constant attention to where you put your feet and cruising along on a nice even surface is extremely rare. To put this in perspective, when we backpack on maintained long distance trails in the mountains, we average about 18 miles per day. On this trip we worked just as hard but achieved an average pace of only 13 miles per day. Trails were surprisingly dry and drained quickly after rainfall. There was almost no walking through boggy or muddy areas. We experienced no areas with brush-thrashing, almost no blow-downs, and little aggressive vegetation. There are no poison-oak/ivy equivalents on the route. There is very little walking on paved roads. When there is, it is mostly within town limits and never along heavily trafficked roads. Drivers were less crazy than we expected, but often drove past walkers with little room to spare. Drivers, surprisingly, almost always stopped for pedestrians at marked crossing areas. 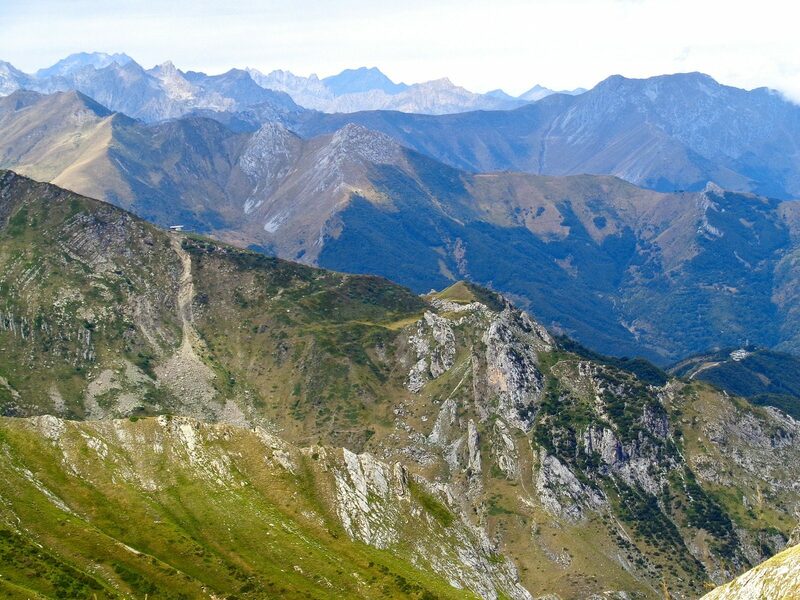 The GTA essentially goes across the grain on the very steep southern side of the Alps. 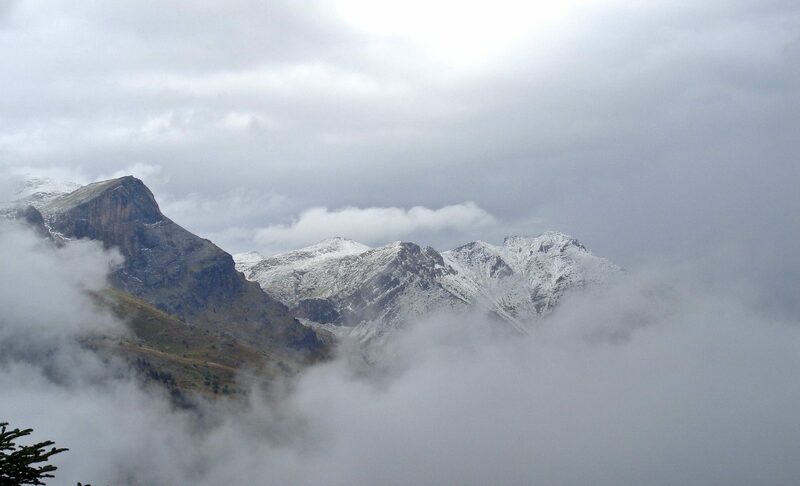 On a typical day we would drop down to around 1000 meters where the winters are mild enough for year-round villages. 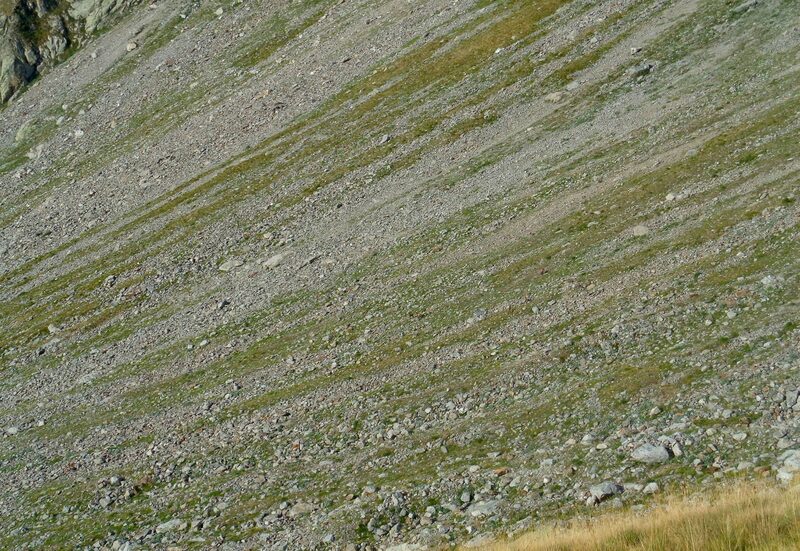 Then we would climb back up to 2000-2500 meters to cross a pass; and then drop back down into the next valley. We would often cross two passes each day. 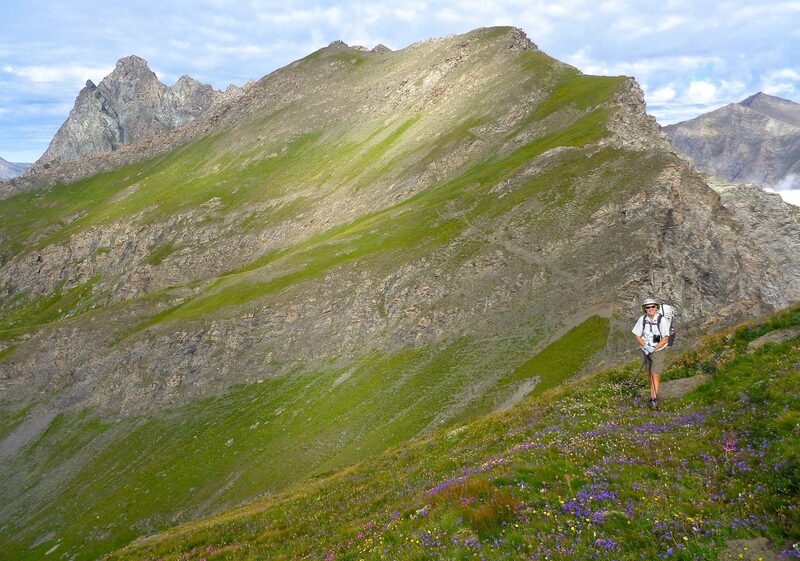 We rarely walked on a moderate grade routed on a valley floor or ridgeline. We encountered almost no mountain bikes except for one afternoon when we found ourselves in the middle or an organized trail race. The only motorcycles we encountered on trails were small bikes being used by local farmers and the riders were always considerate. 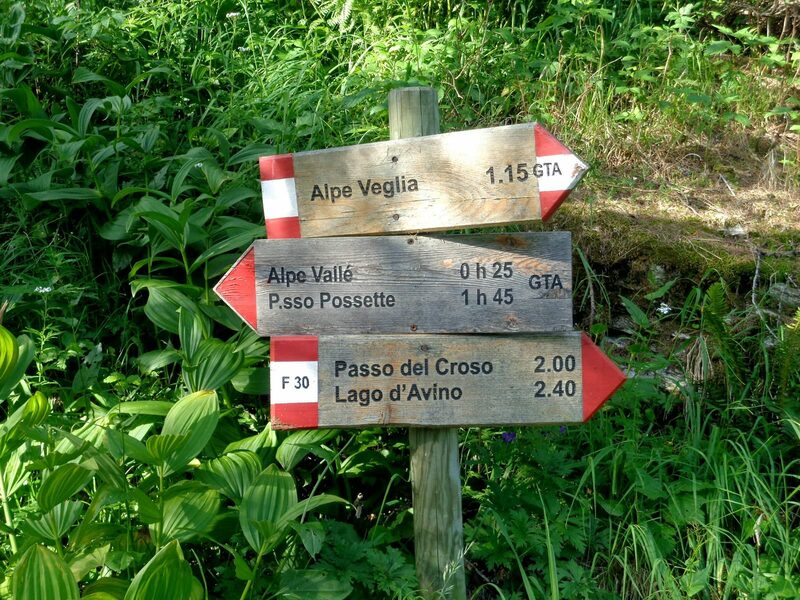 In general, trails are extremely well sign-posted in the Alps. At most intersections, there will be signs pointing to various destinations, often with specific trail names labeled as well. In Europe, signs specify the time between points, such as 1 hour 50 minutes to get to wherever, rather than distances between points. Of course these times depend on how fast you walk. If you know the name of your destination, you can depend on the signage for most, but not all, navigational purposes. We always checked our maps at intersections: sometimes there might be two or more ways posted to get from place to place. And, of course, not everything is marked or signs might be missing. While on the GTA, we would often see “GTA” posted on a sign or marked in some other way. This was reassuring. 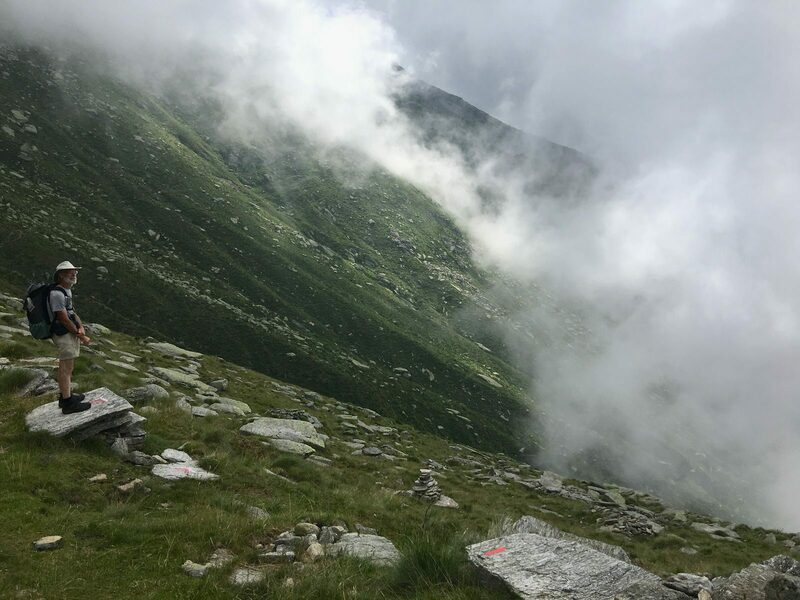 Additionally, the route is also usually marked with frequent red and white randonnée blazes commonly seen on European trails. Most passes were signposted with the pass name and elevation. Route markings within town usually disappeared so expect to do some wandering up and down convoluted alleys. We used a combination of navigation aids. The first was the 1:75,000 maps printed in the guidebook. These were useful enough for general directions and labeled significant points along the route. The text was usually, but not always, helpful. While the text does call out important junctions, there are too many “in a short distance” type of statements. The most important failure in the guide is when there are variants. The authors rarely explain the reasons for choosing one over the other, so we had to choose an option based on intuition, examining other maps, and sometimes just a whim. We often wished they had included a simple statement like “option A is better in threatening weather conditions” or “option B is easier”. We carried paper maps we printed using CalTopo, but the scale of a map packet of reasonable weight for such a long trip rendered these maps marginally useful. We found it impractical to carry 1:25,000 scale maps for such a long trip. We depended heavily on the downloaded GPS track we carried in our iPhone; we used Gaia GPS as our primary app. We charged the phone at refuges and shops. It would be difficult to get dangerously lost. Almost all of the trails were easy to follow and if you took a wrong turn, you would sooner or later end up someplace where you could re-orient. The only time we had a problem was descending in a heavy fog into an area with a multitude of cow paths that cut across our intended route. The way-marking was intermittent at best and the cow tracks just confused everything. Even there, if not for iPhone gps, we would have wasted time wandering around searching for a usable route, but it would not have been dangerous. In a typical year, essentially all the snow on the GTA has melted by early July, and this marks the start of the best hiking season for southbound hikers. You could start a bit earlier on a northbound trip, but since the mountains rise so quickly, you might only gain a window of a week or two. The other factor for selecting a start date is when the refuges open. Since they are a primary source of food, if not shelter, this is critical. 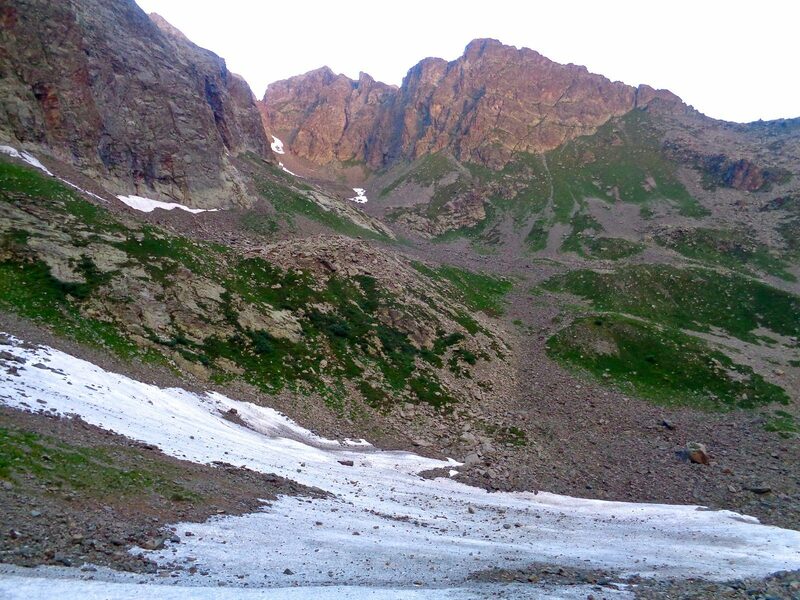 Higher altitude refuges do not open any earlier than the beginning of July and some not until the middle of July. Most close sometime in September. 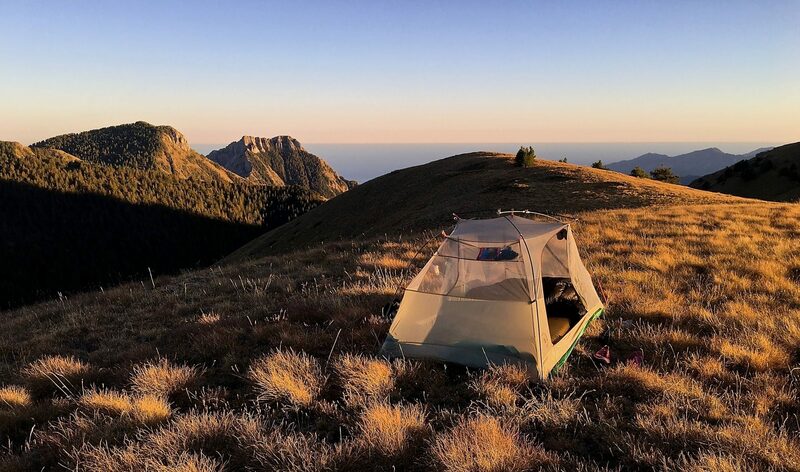 Lower altitude accommodations have longer seasons. 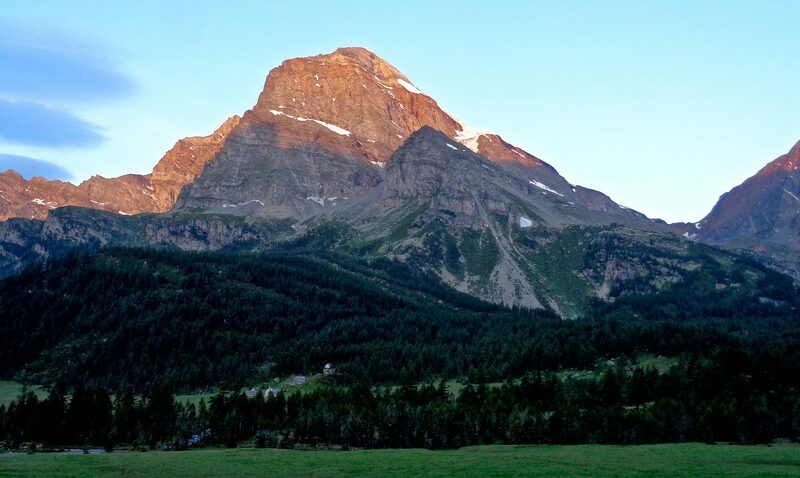 The Rother book lists the opening and closing dates for accommodations, but if hiking early or late in the season it would be worth confirming that those dates are still accurate. We saw no major advantage to walking either northbound or southbound. The trail marking seemed to be equally good in both directions. 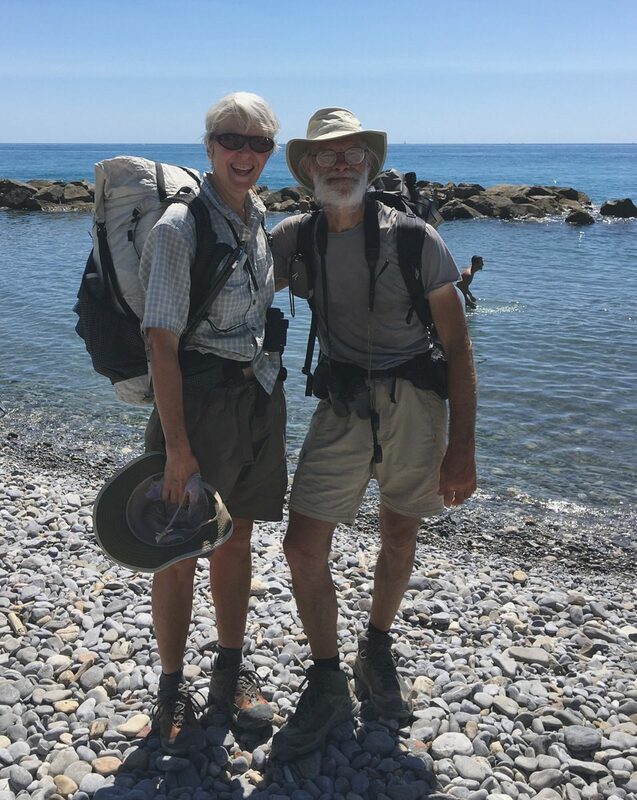 We went southbound because to us it made sense to finish the walk at the sea instead of yet another alpine pass and there are many more transportation options at Ventimiglia that at Alpe Cruina. 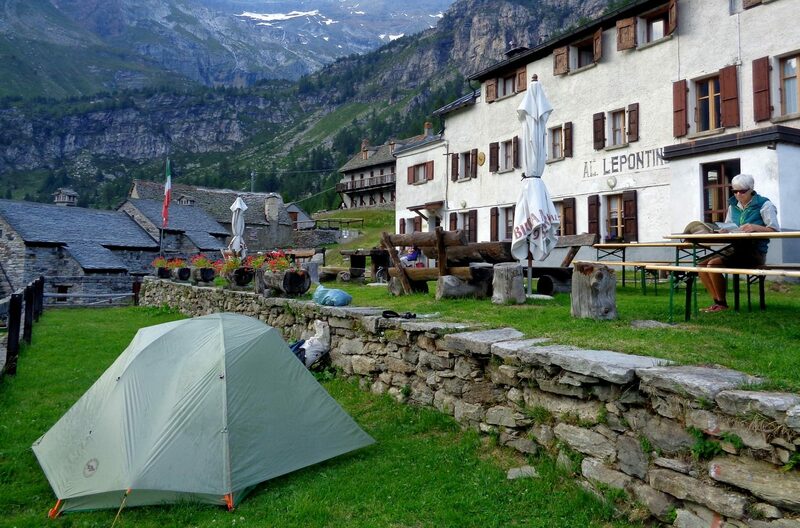 We camped every night except one: in Alagna we got a room so we could shower, do laundry, and generally reorganize. 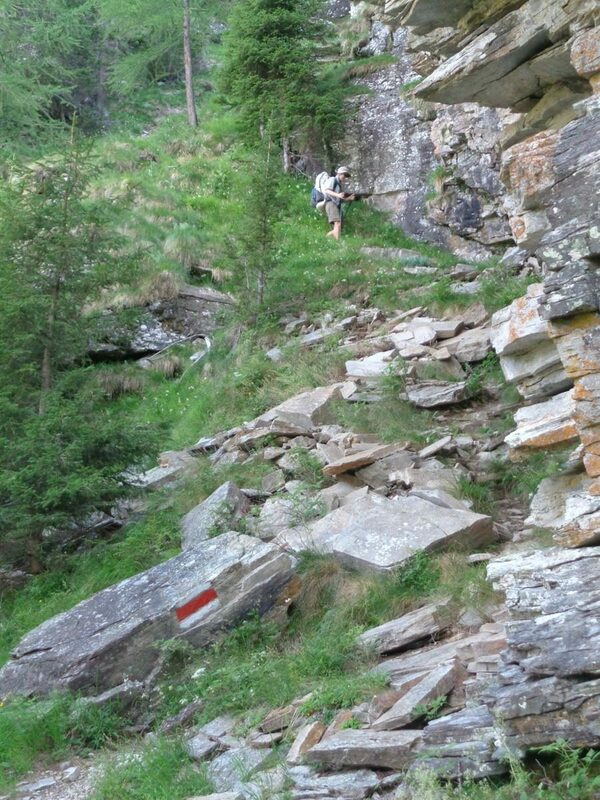 This is not the norm for other European hikers. While on the GTA, we saw fewer than five other groups using tents. People stay in the refuges, which, to us, must be an acquired taste, given how closely packed everyone is in the communal sleeping rooms. We never had an issue with camping. 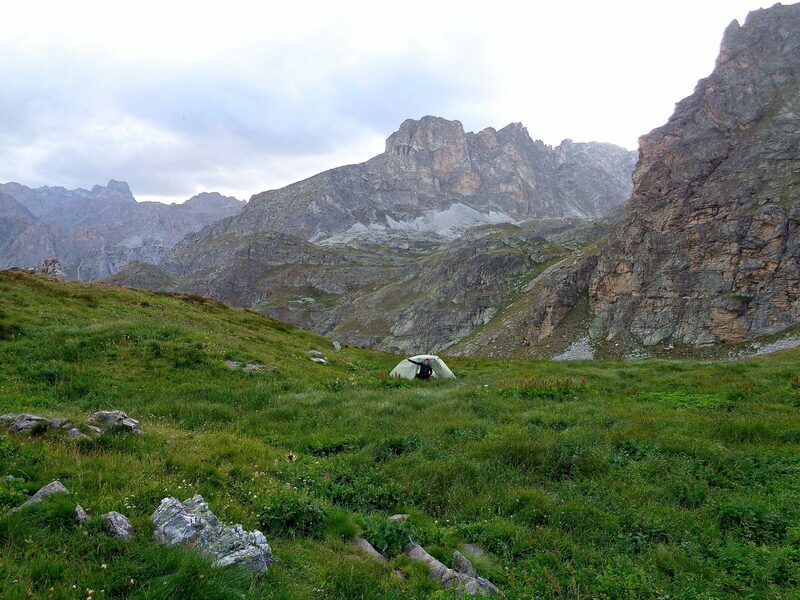 Unlike in Switzerland and Germany where camping is strictly limited, in Italy nobody cared where we set up our tent. When we asked, people said to camp wherever we liked. 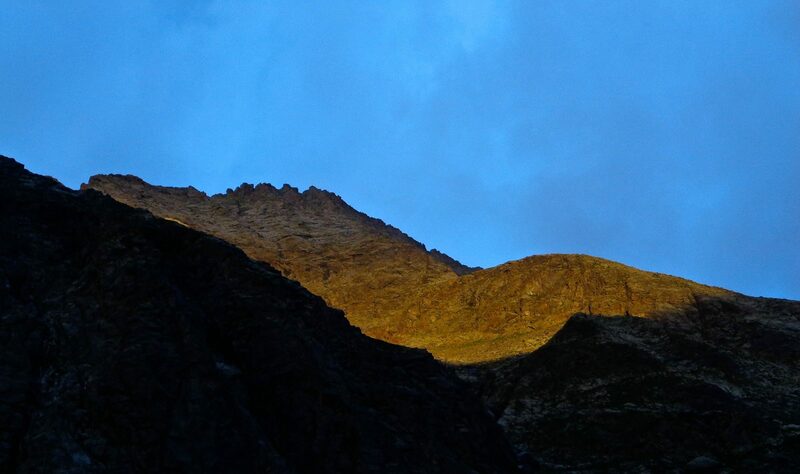 The refuge guardians directed us to the best tent sites adjacent to their buildings. We camped in fields, next to rivers, in old buildings, on church porches, in parks and picnic areas. 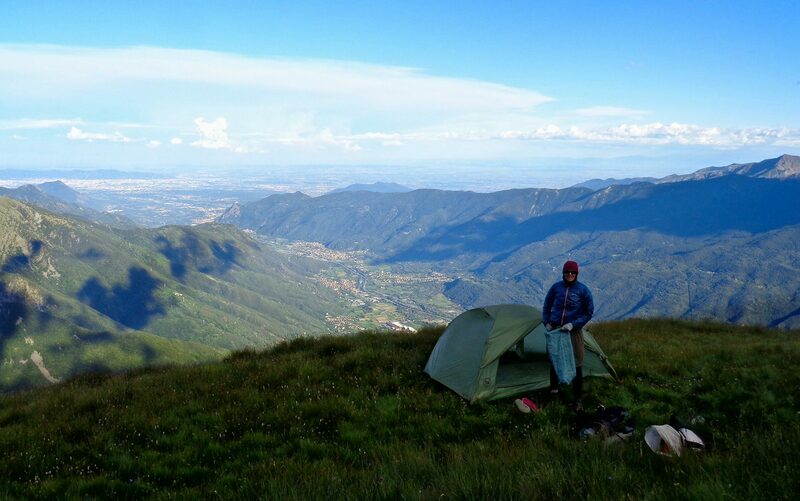 Most of the time, finding decent to superb campsites never took too long. 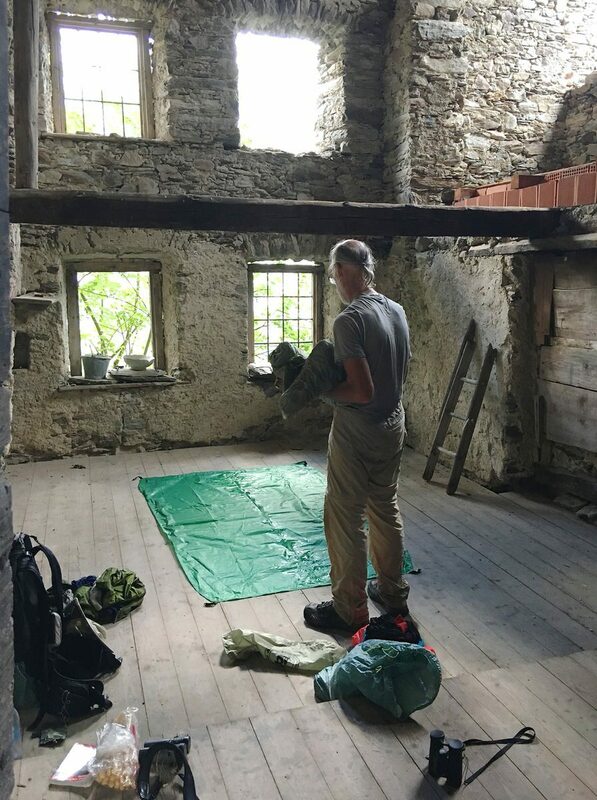 Occasionally, the terrain made finding a perfect flat and level place a bit time consuming, but we never had a less than adequate site. Many sites were fabulous, providing stellar views and very comfortable places to stay. 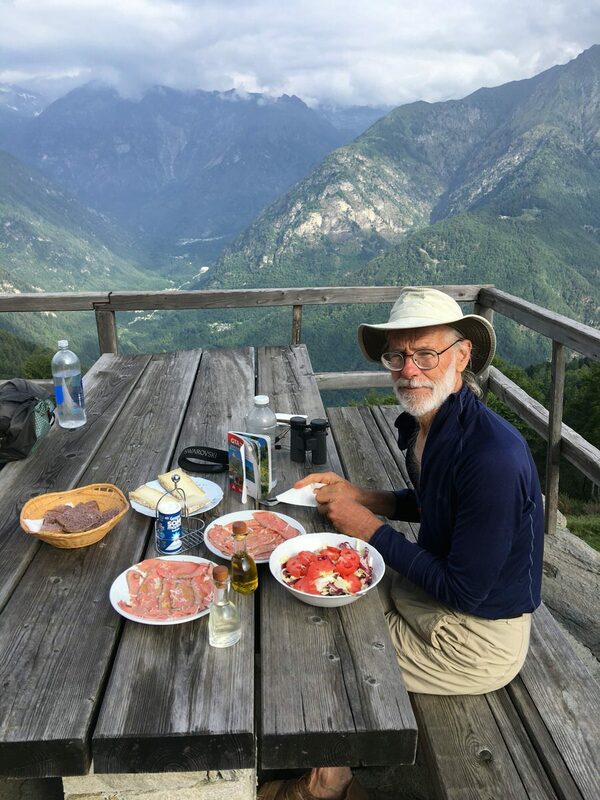 Unlike most long-distance thru-hikes in North America, in Europe you do not need to carry large amounts of food. If you stay in refuges, dinner and breakfast are provided and packed lunches can be purchased. The downside is that the meal schedules are rigidly fixed. Breakfast is coffee and dry toast and starts at 7. Lunch is served from 12 to 2. Dinner starts at 7 or 7:30. In between, obtaining a meal is unpredictable. In most refuges, the staff was happy to provide us with some simple foods, like omelets, a salad or hot sandwiches. But we couldn’t get pasta or a main course except during the standard mealtime. The smaller the refuge, the more flexible and accommodating the staff were in terms of serving food outside the normal meal times. Beer, wine, and other beverages were always available. Prices varied quite a bit from place to place, but were usually surprisingly reasonable, especially considering that many refuges are resupplied by helicopter. A flavorful and hearty evening meal of three to five courses cost about 18 Euro. The food was almost always decent and often very good. Shopping in the small villages was also hit or miss. 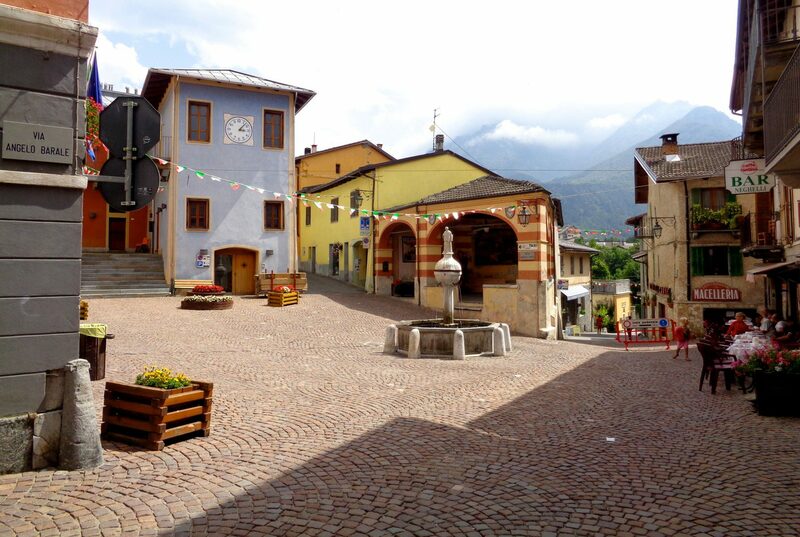 Many, but not all, villages had an alimentari (grocery store). They were always closed between about noon and 4. Selections varied, but we ate a lot of cheese, salami, and crostini. Village restaurants often had quite tasty food, but rarely sold much except beverages and ice cream during non-meal hours. Finding water was not an issue. 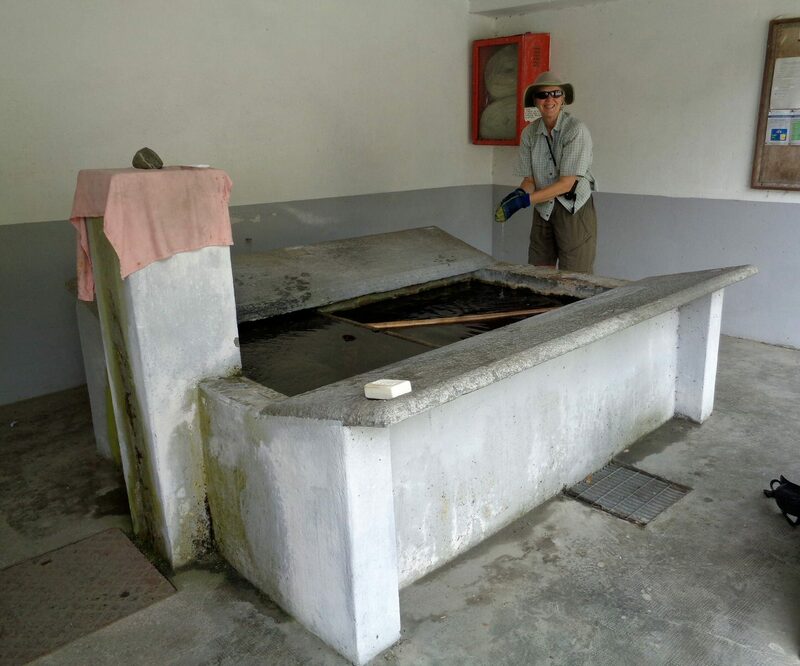 Every town and refuge has a font and much of the high altitude surface water is safe to drink. We rarely thought it necessary to treat the water and had no problems develop. Shower access can usually be purchased at a refuge. Doing laundry was a problem. Laundromats are not to be found along the GTA. We washed bits of clothing in streams and public fonts. 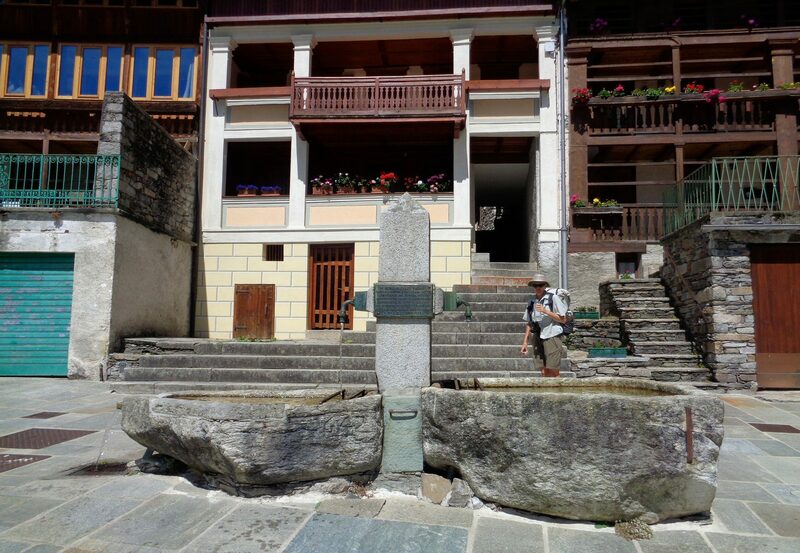 In Alagna, our hotel had a washing machine and in Susa, the only large town on the route, we found a dry-cleaner who wet washed our clothes for a few Euros. Most of the time, our clothes were a lot dirtier than we liked. We met no one who was thru-hiking the GTA. We encountered only a few other backpackers and those people were out for one to two weeks and section-hiking the route. 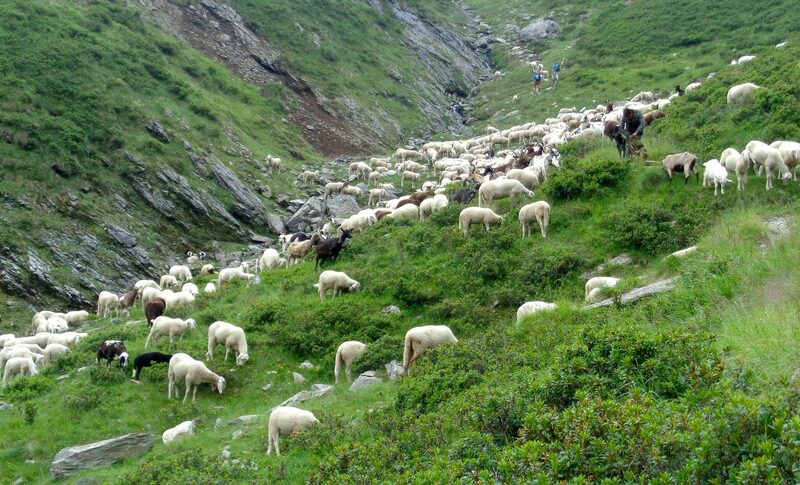 Especially on weekends, we often encountered large numbers of day hikers heading to a refuge for the mid-day meal. We were at one refuge on a beautiful Saturday where they served lunch to well over 100 people. Over half of the backpackers we met were German or Swiss. 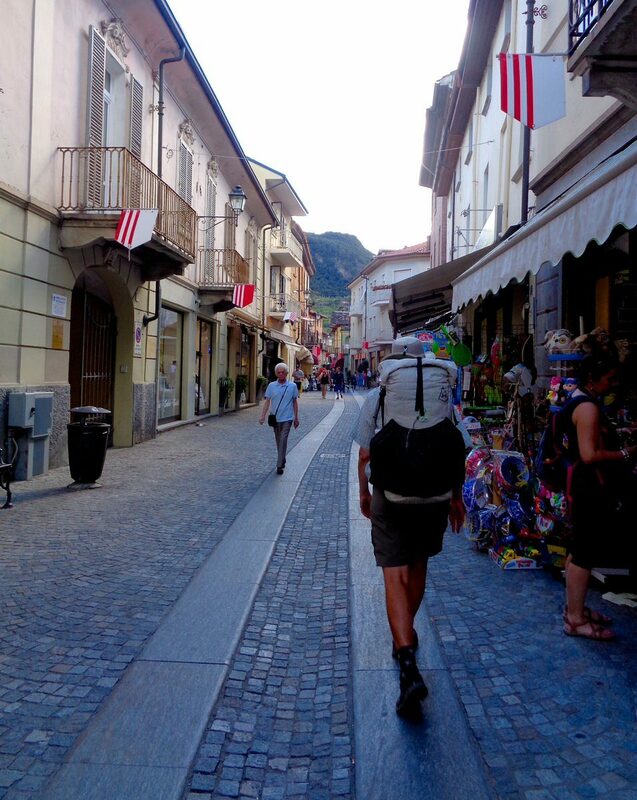 We encountered only a couple of Italian backpackers and a few people from the Netherlands, Belgium, and France. We met only two people from Britain. We did not meet a single American anywhere while on the route. In most places we went, the fact that we were American made us interesting novelties to the local people. Lightweight backpacking techniques were not evident among the people we met. Even though they were staying in refuges and had no need to carry pads or a tent, most people carried bigger loads than we did. Most hikers were still wearing at least medium-duty mountain boots. The only people we met carrying lightweight gear were a solo German and the two people from Britain. Neither of us speaks Italian, but Amy has a bit of French and Spanish. Communications sometimes took a bit of effort, but we were always able to succeed in the important matters, such as getting a meal. Most of the foreign hikers we met spoke English; many locals spoke French. We met one refuge manager who years ago had lived in our hometown of Palo Alto. We were extremely fortunate with the weather. We experienced a couple of short heat waves that made hiking less than comfortable. We had enough rain on two days that we sought shelter for a couple of hours. We had hail and a bit of snow on a couple of occasions. But for the most part, it was dry and pleasant. Like California, we learned that Italy has been in a multi-year drought and the closer we got to the Mediterranean, the more evident it was that they needed rain. We had only a single cold night. Long-term weather records indicate we should have experienced more rain than we did, so we have no complaints. 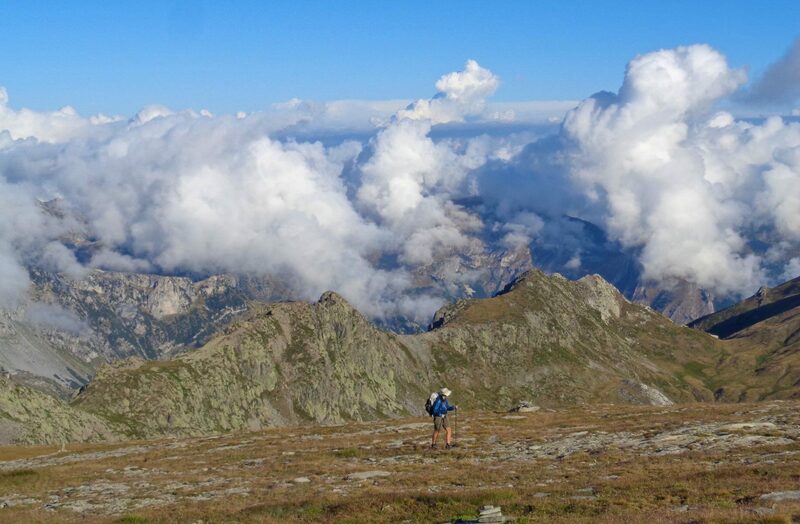 During the hiking season, thunderstorms can be common in the high mountains, particularly in the afternoon. We were never forced to stop due to lightning, but we did have a few days where we were concerned. Birding was the single biggest disappointment on this trip. Apparently birds are still persecuted in Italy, so they were scare and those we did see fled as soon as they were aware we were around. Compared to other trips to Europe, we saw a lot fewer species and far fewer individuals. We could sometimes hear birds singing and calling in the woodlands, but could never coax them out for a look. For instance, we saw zero woodpeckers on this trip. This was truly disappointing, and may discourage us from returning to Italy to hike. On many days we saw fewer individual birds and fewer species than we see in our own small suburban back yard. We had one life bird, Rock Partridge, seen at altitude on rocky slopes on two occasions. We had some nuisance insect issues, but far fewer than might be expected. At a couple of campsites, evening mosquitoes drove us into the tent, but normally they were not a problem. Occasionally, biting flies were annoying. 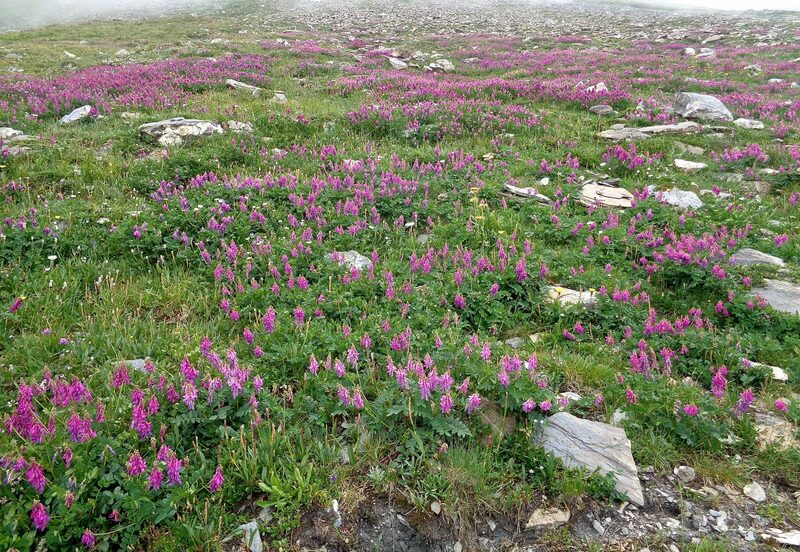 However, compared to other mountain environments we have walked in, insect problems were minor. Aggressive dogs can be a problem for hikers. We had numerous encounters with barking dogs, but only a few where we felt directly threatened. Most dog encounters were with animals guarding flocks of sheep, goats, and cows. When the shepherds were in the vicinity, they always controlled their dogs; when they weren’t nearby, the dogs sometimes came closer to us than we liked. Our worst encounters were with undisciplined household dogs in some of the tiny villages, but we were never actually bitten. Fending the animals off with hiking poles always worked. Fantastic report, guys! 🙂 It made my day shine! I enjoyed following your journey and reading the excellent summary. Thanks! amazing! thanks for taking the time for such a thorough report. better than the guidebook, i imagine. Awesome report though could someone tell me how cold it is at higher altitude parts of trail in comparison to temperature at bottom parts and forecasts? 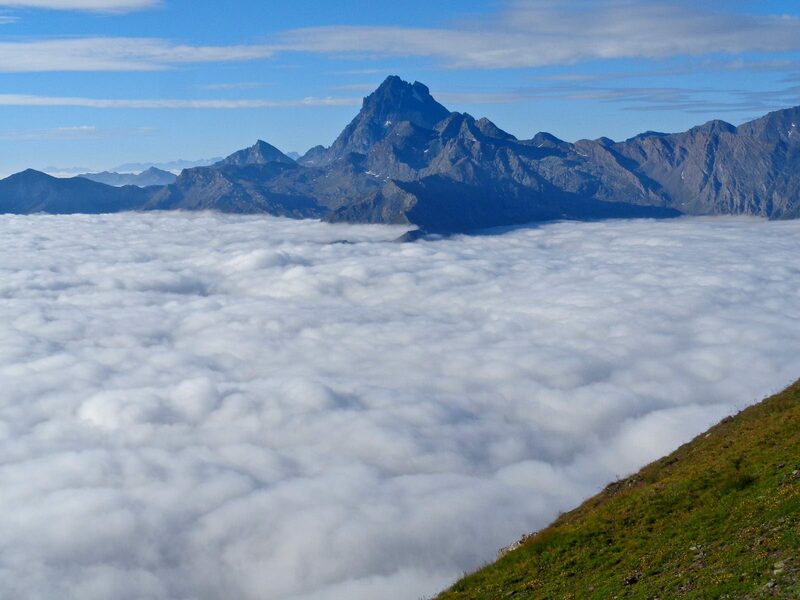 I’m planning to go on this trip for august, and i’m not sure what clothes to take for tops of mountais, colder days. e.g Rain pants or quilt or nothing? When we were there it was hot at lower elevations and moderate at upper elevations. We take essentially the same gear on all trips so that we are prepared for any weather, and that includes rain pants and warm sleeping quilt. We were there in a dry period, and can’t speak to what it might be like in normal conditions. This is an awesome write up, and a great introduction to this route, which I am just learning about. Thank you so much for sharing it with everyone! Very helpful in all respects. Tom, we’re glad you found it useful. Please let us know if you decide to hike the GTA! We camped every night on our trip and never felt hostility from anybody. We told everybody that we were camping. Guardians of the refuges would point out the best place to set up a tent. We ate dinner at one commercial lodging and told the proprietor that we were planning to cross the field and camp by the river; he told us that it would be easier and more comfortable to camp next to the picnic tables in front of his restaurant since it was nice level grass. Think about a group of northern European university students who head to Italy for a holiday week. They set up camp on a beach next to a hotel, play music, build campfires, drink a lot of beer, and are visible from the hotel rooms. 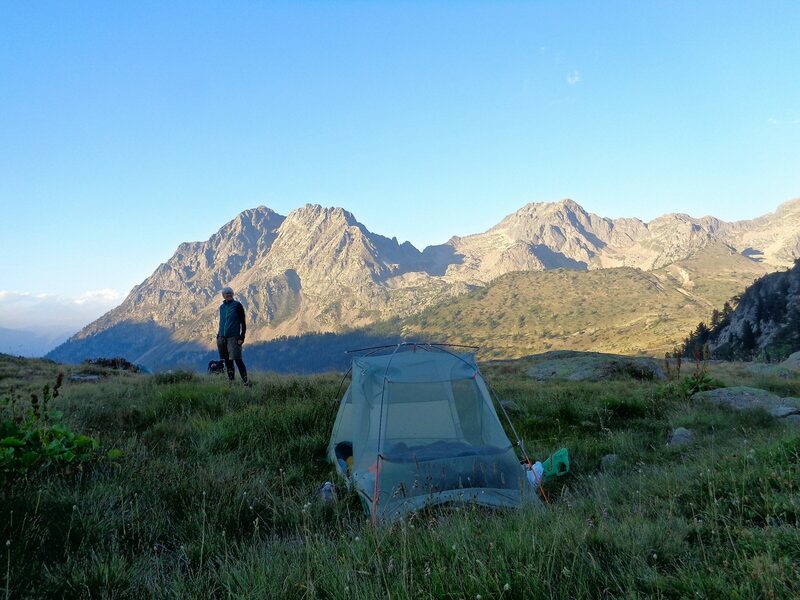 It is not surprising that wild camping rules would be enforced in that situation. 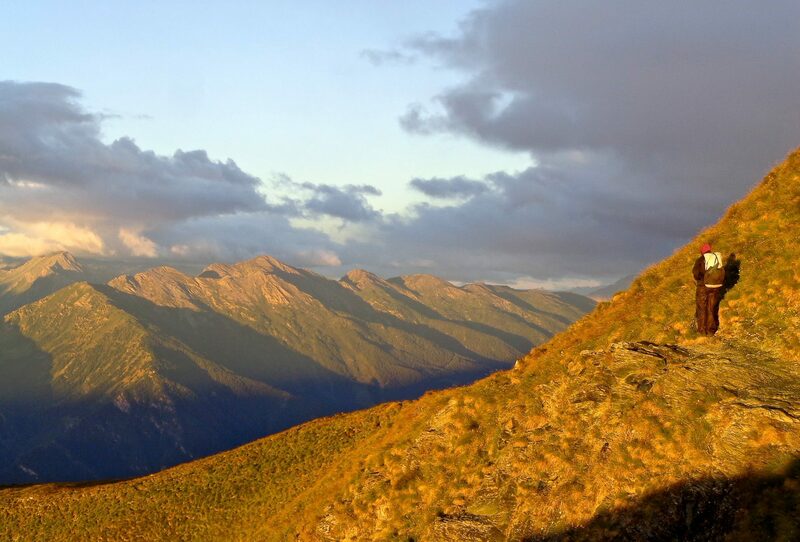 Contrast that with a couple of hikers who practice all of the stealth camping protocols — no fires, no noise, no litter, no damaging vegetation, set up the tent at sunset and break camp at sunrise, avoid setting up in view of a building unless permission is granted, and avoid setting up in view of a road. 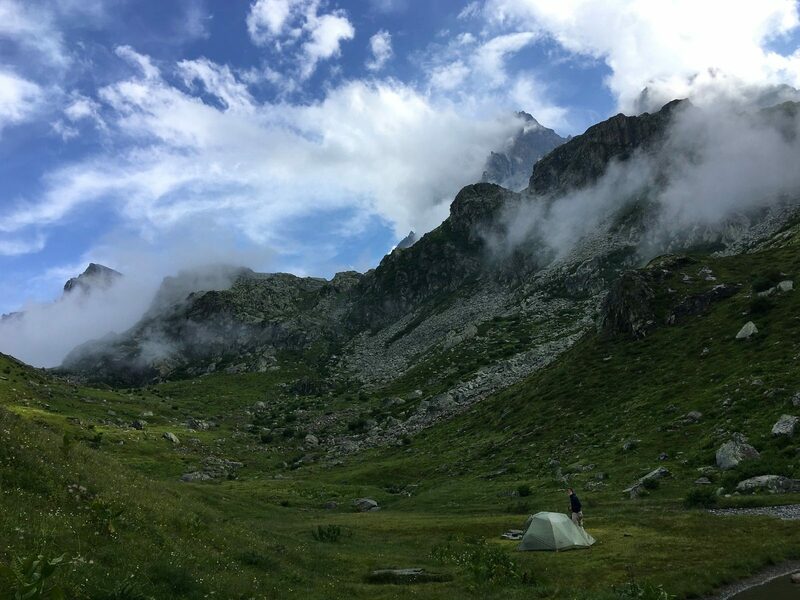 The French have formalized this into a distinction between “camping” and “bivouacking”; I believe the formal rule for a bivouac is that you don’t set up until after 7pm and you depart early in the morning. If you wish to camp at a location where there are people around, ask permission and it will likely be granted. If you are in the mountains away from any buildings, then just set up in the open and don’t worry about it. If you are near a town or settlement, but there are no people around to ask, then make an effort to tuck into a corner where you won’t offend anybody. For example, if you’re camping at a town park, then don’t put your tent in the middle of a football field that is visible to all the neighbors. Instead, set up behind the bathroom building where the only people who will see you is somebody out walking a dog. 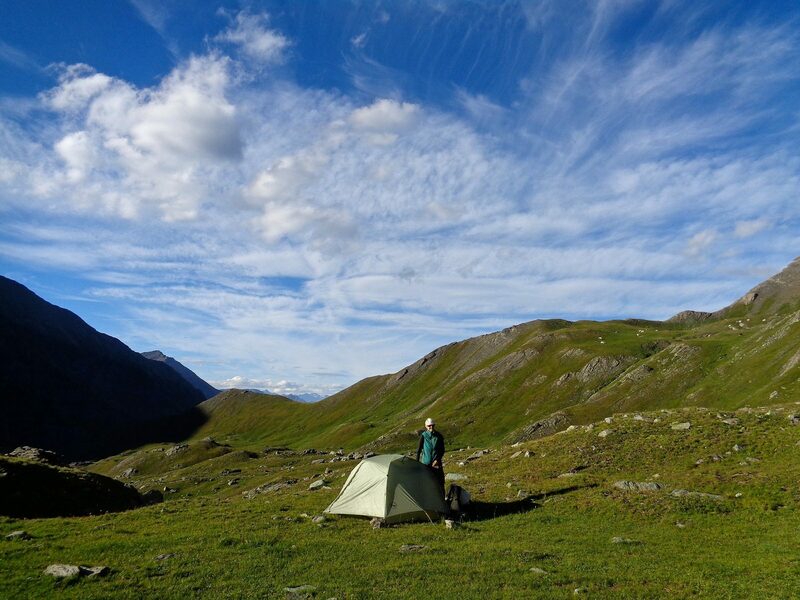 We have wild-camped on hiking trips many hundreds of nights and have never heard an unfriendly word. Most nights we are not seen. When somebody does pass we say a friendly good evening and get a friendly response. On only one occasion have we been asked to leave. We were traveling by car in Morocco on a birdwatching trip. We wanted to spend a night in a nature reserve adjacent to one of the royal palaces on the coast. We asked the soldier who was guarding the entrance to the palace for permission to camp next to a picnic table about 50 meters away. He said “pas de problème”. In the middle of the night a police car arrived and told us we had to move. When I told him that we had permission from the soldier he said “but that is the soldier and he doesn’t matter, I am the police and I say you can’t camp here”. He was polite but firm and we had to pack up and move. In hindsight we think he just wanted a bribe and he would have left us alone. 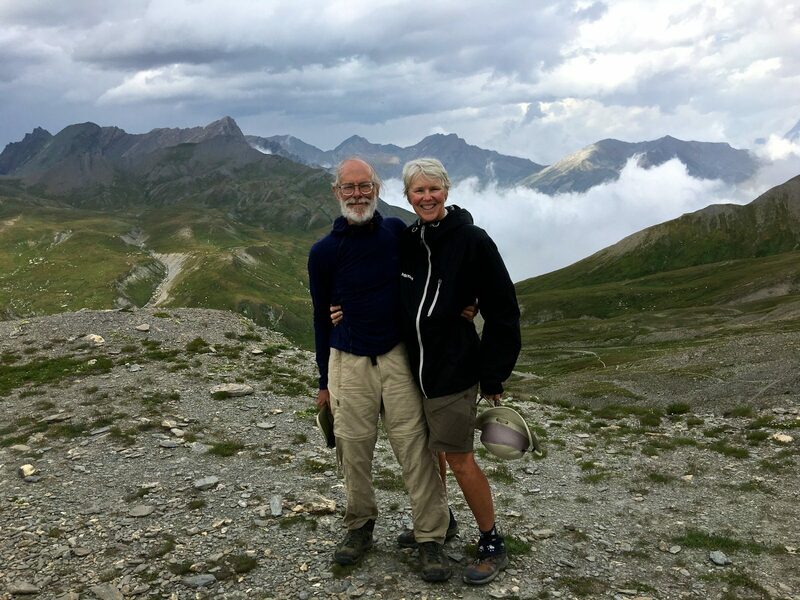 Kendall, we spent about $1300 per person while we were hiking during 41 days on the GTA and 6 days post-GTA hiking in the Maritime Alps; that’s about $28 per person per day. That does not include transit costs to and from the trail, books we purchased prior to the trip, or accommodations pre and post hike. The bulk of that money would have been spent on food. We took advantage of any opportunity to eat in a refuge or restaurant. Hi Amy & James, thank you so much for sharing your experience on the GTA, very useful. In 2 weeks’ time it’s our turn to hike a part of the GTA, (about 12 days). it will be our first multiple day hike and I am still trying to figure out what works best for me in terms of gear. As I am not a big fan of heavy or mid hiking boots I am thinking of wearing trail runners. 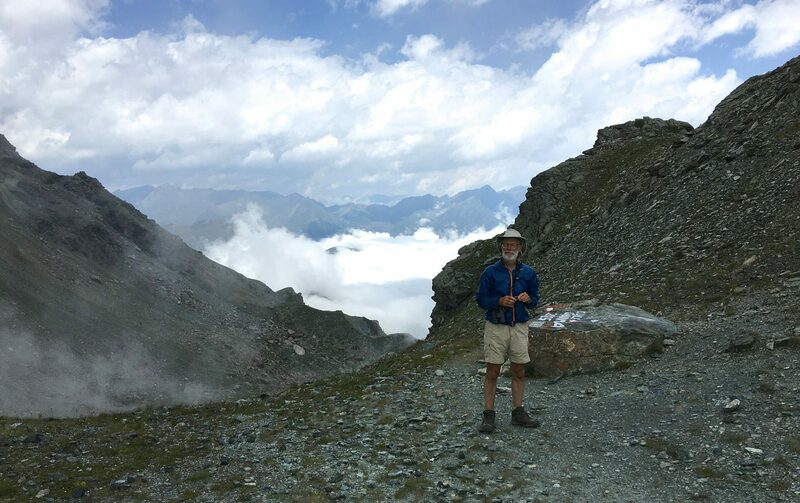 However, here in The Netherlands (in this low and flat country) it almost seems a rule of thumb to wear at least mid hiking boots when hiking in the Alps. What’s your advise? Noelle, I (Amy) wear trail runners on all of our hikes. James has arthritic toe joints and needs a fairly stiff sole, so he wears mid-weight hiking boots. If you’re used to wearing trail runners then I think you’ll be most comfortable in those.